Muslims eat halal food. But what is halal food and why it is necessary for Muslims to eat halal food? 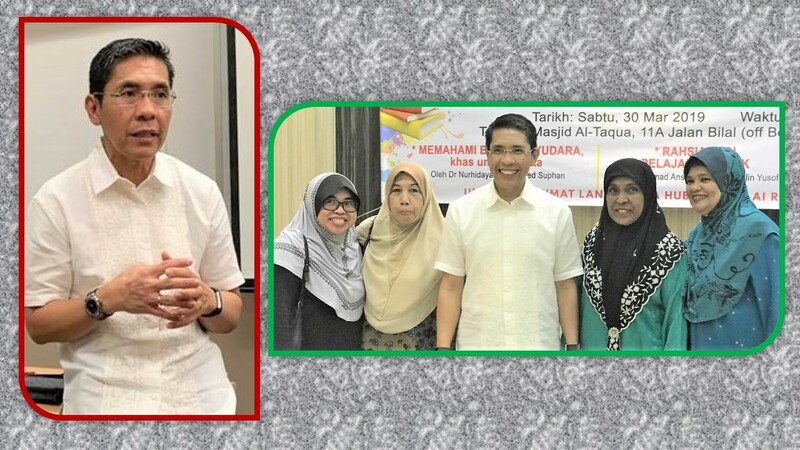 The writer of this article gave a talk on halal food in a “Workshops together with M3” event at Masjid Al-Taqua on Saturday, 30 March (2019), in the Dietary Understanding and Restrictions workshop during which two other speakers gave their explanations from the Buddhist and Hindu perspectives. 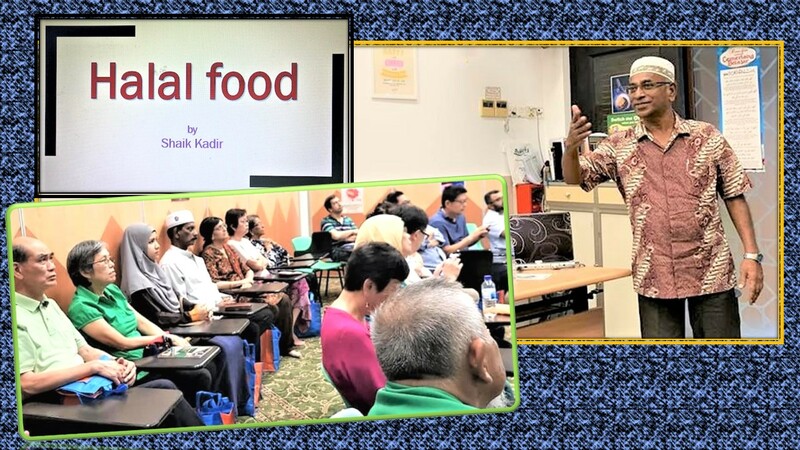 The presentations on “Vegetarian and halal food” was attended by grassroots leaders of the Siglap constituency. “Vegetarian and halal food” presentations for the Siglap Constituency grassroots leaders: The three speakers were Venerable You Guang who explained vegetarian food from the Buddhist perspective; Mr Shukul Raaj Kumar who explained vegetarian food from the Hindu perspective, while Mr Shaik Kadir, writer of this article, talked about Muslim food, known as halal food. Why non-Muslim Singaporeans need to know about halal food? Food is one of the binding factors of Singaporeans. We eat together during marriage invitations, and during office, public and social functions. As Singaporeans are of various races, cultures and religions and their dietary necessities might differ from each other’s, it is good to know about Muslims’ dietary requirements, popularly termed “halal food”. Why must Muslims eat halal food? Being followers of Islam, Muslims follow and obey the instructions of God as given in the Qur’an, the Holy Book of Islam. To live in Islam is not merely to prepare for the spiritual world in the Hereafter, but also to live a complete way of life right here in this material world. Islam aims at a total package of human development and enhancement in all human dealings and matters. How to ensure if the food is halal? If the whole country comprise Muslims, the word “halal” will not be labelled for food as all food is deemed to be halal. In the same way, a Muslim eatery will not label the food it sells as halal since a Muslim eatery will not be selling non-halal food. Only in a country where there are people of many religions, and when the owner of an eatery or food production company is non-Muslim, the word “halal” (with its identification “halal” logo obtained officially) is displayed to indicate that the food sold is halal. Singapore as well as some other countries have authorities to oversee halal food and food products that can be consumed by Muslims with their own respective iconic “Halal” logo. 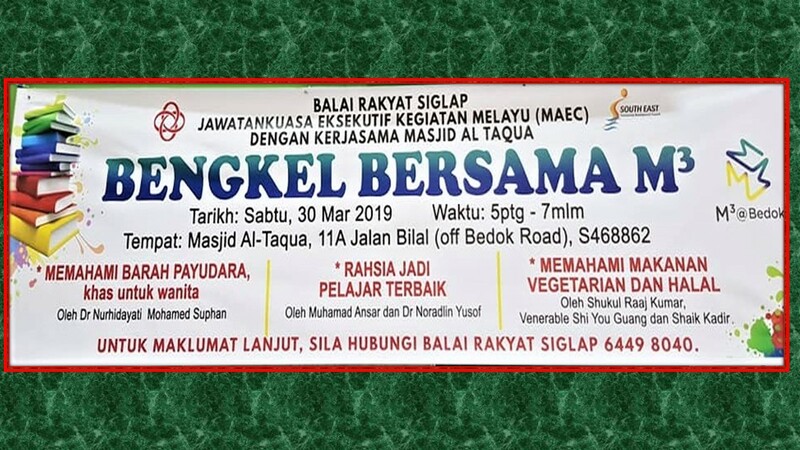 The “Halal” authority in Singapore is the Islamic Religious Council of Singapore, popularly known in its Malay term as Majlis Ugama Islam Singapura (MUIS), issues halal certification after thorough examination. The most familiar halal food logo to Singaporeans is the circular one in the middle with one, the first one, on a food package. Examples of halal logos from other Asian countries shown here are from Malaysia, Thailand and Japan. The 3 letters in Arabic (from the Qur’an) are, from right, hah, lam-alif, lam = halal. The Singapore halal logo being prominently displayed to attract Muslims. Polar also displays the Halal certificate which all food companies receive after successful application for halal certification upon thorough inspection of the premises, including cleanliness of the kitchen, utensils used and other necessities by the Islamic Religious Council of Singapore, popularly known in its Malay term as Majlis Ugama Islam Singapura (MUIS). What does the Qur’an mention about eating halal food? Halal is an Arabic word used in the Qur’an. (The Qur’an is in Arabic, it’s original language, and is available in almost all Muslim homes and can be bought from Muslim bookshops.) ”Halal” means allowed, permissible or lawful in Islam. (The opposite of halal is haram.) Thus, halal food simple means food that is lawful for Muslim consumption. As has been reiterated, Muslims take halal food in obedience to God’s command. In the above verse, God is saying that He has provided for us huge varieties of good things that can be eaten. In the above verse now, God explains that halal (lawful) to Muslim consumption are all items that are “good and pure”. That is to say, anything that is NOT good and pure is haram and Muslims should avoid them. That may include alcohol, drugs and cannabis, etc. With regard to smoking, some Muslim scholars say smoking is NOT “good” for health and therefore is haram, while some other Muslim scholars say that smoking may not be haram but definitely makruh, meaning it is “good to avoid” it for very good reasons, in this case, smoking is hazardous to health and incurs wastage of money. 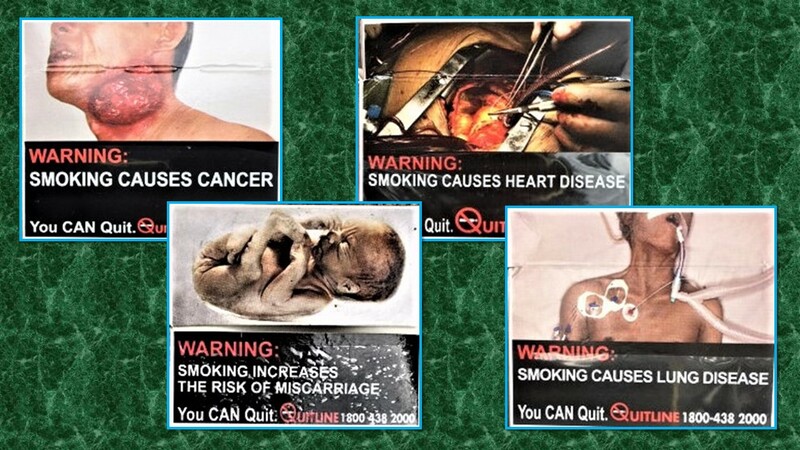 Warning dangers of cigarette smoking shown on cigarette boxes. Smoking, related to intoxicants (agents that can cause addiction and harm to one’s own-self and others) can cause several problems, including cancer, heart and lung diseases and even miscarriages. Smoking is such a health concern that “No Smoking” warnings are advertised in newspapers and posters displayed. 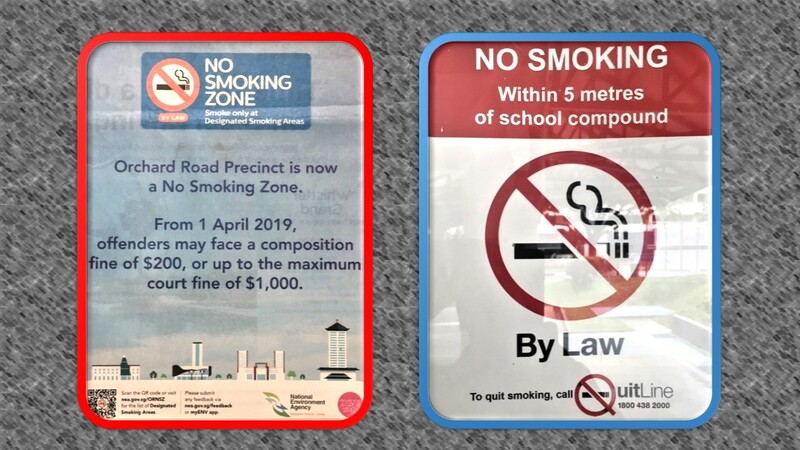 It is against the Singapore law to smoke in places such as work areas, public buildings, public areas such as exercise corners and children’s playgrounds, school premises, stadiums, cinemas, shopping malls, restaurants, hawker centres and in bus-stop shelters. What is haram for food? Consumption prohibition does not apply to pork only, but other “things and actions” related to eating are prohibited too. Since pork is haram, the derivatives of pork like lard, ham and bacon are also haram. In Islam, the meat of predatory animals, like lions, wolves and so on are also haram for consumption. Is showing compassion important in slaughtering animals? Yes it’s very important. Cruelty to animals whether during slaughtering animals for eating or during any other time is a sin. There are a number of Hadith narrations which show Prophet Muhammad, Peace be upon him, praising those who showed compassion to animals. During slaughtering of animals for eating, the animal needs to be calmed down, and the cut, with a sharp knife, is to be effected on the jugular vein at the neck which would stunt the animal and it would not feel any pain. There should be no twisting of its neck, knocking its head on a hard surface and so on as sudden death would suppress blood flow out of its body. In Islam, drinking blood or eating congealed blood is haram. The Muslim person slaughtering the animal is to have the intention of slaughtering the animal for food and he softly says: “In the name of God, I slaughter this animal for food.” Or just “Bismillah” (In the name of Allah) as his intention and action is understood. In the most basic form, if he has many chickens, for example, to slaughter, he need to say the slaughtering prayer only once at the time of slaughtering the first chicken. If ever the animal feels any pain before it dies, the prayer that has been said is the defence – that the slaughtering is done not for fun, game or gambling but for food. In nature (as you could watch from any wild-life documentary video), you will see a cattle, for instance, suffers enormously when attacked by a group of lions biting the victim’s legs, back and neck until it falls from its standing position and then still biting all over its body as it struggles till it finally dies – but all for the sake of food to live: one cattle dies, several lions live. Can Muslims be vegetarians, eating only vegetables and fruits? Eating vegetables only is a choice if a Muslim wants to, but Muslims are allowed to enjoy eating meat and vegetables for a balanced diet as nutrition is found in vegetables, meat of all halal animals, eggs, cereals, nuts, fruits, and so on. Muslims eat them as long as they are “halal, good and pure”. Also, by nature, certain animals, like lions, eat only meat; and certain other animals, like goats, eat only vegetables. But, human beings are creatures that can consume any halal animal meat as long as they follow their respective religious restrictions and health advice, if any. In Islam, not only food must be halal but drinks too. In the Qur’an the prohibition of alcoholic drinks is mentioned in an all-encompassing term as “intoxicants”, and is cited together with gambling. “Intoxicants” as mentioned in the Qur’an refers to any agent that causes the mind to befog and lose the ability to reason, and can cause addiction. Thus, intoxicants include alcohol, drugs, marijuana, cannabis, and so on. They are all haram in Islam. “If you drink, don’t drive.” Singaporeans are familiar with this slogan which was initiated many years ago by the Singapore Traffic Police, the Singapore Police Force and the Singapore Road Safety Council. Referring to intoxicants and gambling, the Qur’an uses the phrase “an abomination of Satan’s handiwork” for their possible dire consequences, such as divorces, broken homes, fights and loss of dignity. Many marriages have broken down; many matured, even educated, people have ruined their lives. Many families have been shamed because of their spouses or children’s indulgence in alcohol, drugs and gambling. Since alcohol is haram because they are connected with numerous social ills, it is also haram for Muslims to sell alcoholic beverages, like beer, brandy and whisky, as well all the other addictives. 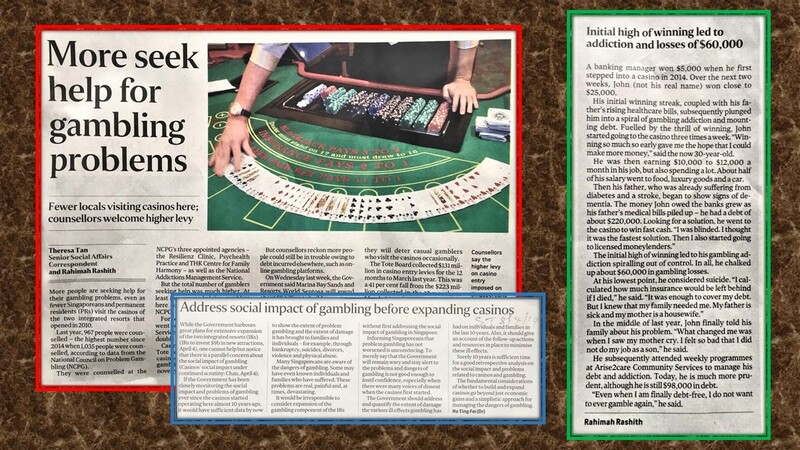 “More seek help for gambling problems” and “Initial high of winning led to addiction and losses of $60,000” are articles from The Straits Times of 8 April 2019, while “Address social impact of gambling….”, by Dr Ho Ting Fei is from “FORUM” of the same newspaper. Dr Ho says that “…gambling and the extent of damage it has brought to families and individuals – for example, through bankruptcy, suicides, divorces, violence and physical abuse” – has to considered before expanding casinos in Singapore. Apart from eating halal food, are there advice on other food and eating habits? Islam commands believers to eat halal and taiyib food and drinks. • when eating, a person must not “follow the ways of the devil”. According to Muslim scholars, the advice “Follow not the ways of the devil” refers to dirty ways of preparing the food, dirty utensils like plates and bowls and spoons, drunkenness, over-eating, like eating too much mutton, sugar etc, gluttony and food wastage, like bedecking one’s plate with food at a buffet and leaving it half-eaten while blind to the fact that in your own country or in some corners of the world people do not even get one proper meal a day. 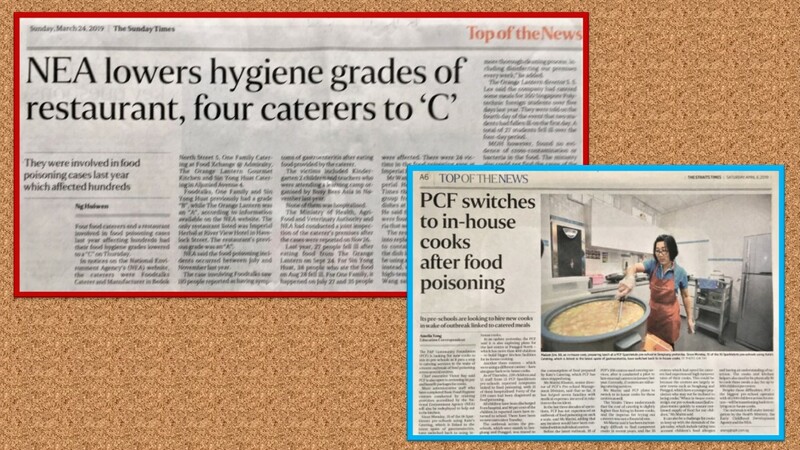 Kitchen hygiene, namely freshness in food items and cleanliness of kitchen and utensils, is important in food preparation: Hygiene grades of a restaurant and four food caterers downgraded by the National Environment Agency (NEA) because “They were involved in food poisoning cases last year which affected hundreds” is a report from The Sunday Times of 24 March 2019.. In Islam, eating is part of the total Islamic package of positive and gratifying living. It therefore teaches Muslims to eat halal (lawful) food and taiyib (good and wholesome) food and avoid following “the ways of the devil” because such food impresses on the spiritual uplifting, well-being and health of the individual believer. 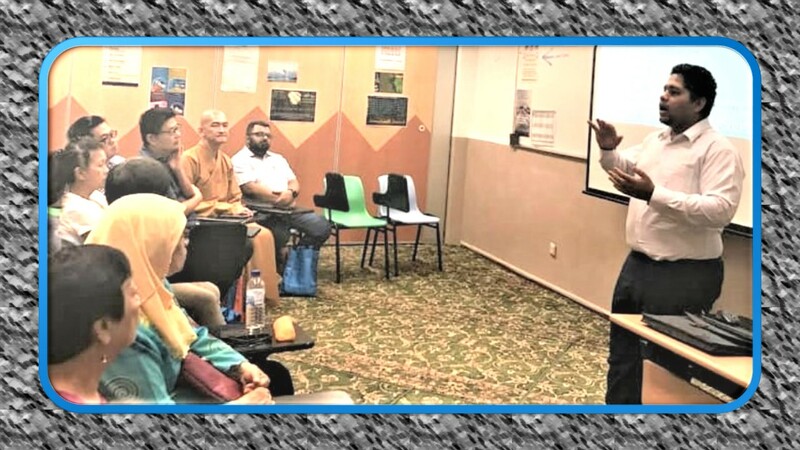 During a talk on halal food in a “Workshops together with M3” (or in Malay, “Bengkel bersama M3”) event at Masjid Al-Taqua on Saturday, 30 March (2019), the speaker delved on what is halal food and why it is important to Muslims. The talk on halal food comes under the Dietary Understanding and Restrictions workshop, which is one of the four workshops in the “Workshops together with M3” event organised by the Malay Activities Executive Committee (MAEC) of Siglap Community Centre and supported by Mesra, Mendaki and MUIS (with the 3M elegantly branded as M3). One of the banners of that gives basic information about the “Workshops together with M3” event held at the Taqua Mosque on 30 March 2019. 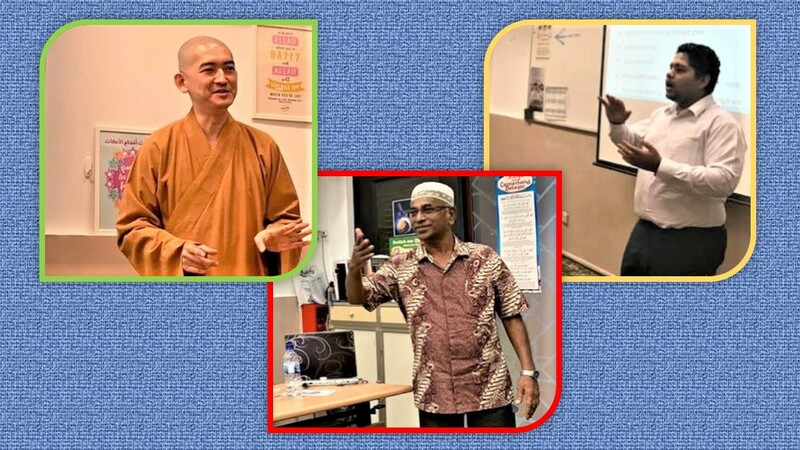 The Dietary Understanding and Restrictions talk, presented by three speakers, shared food information from the perspectives of three religions – Buddhism, Hinduism and Islam – aimed at fostering racial harmony and cohesion in Singapore’s multi-racial, multi-cultural, multi-religious society. The speakers, Venerable Shi You Guang and Mr Shukul Raaj Kumar, talked on vegetarian food from the Buddhist and Hindu perspectives respectively, while Mr Shaik Kadir talked on halal food. 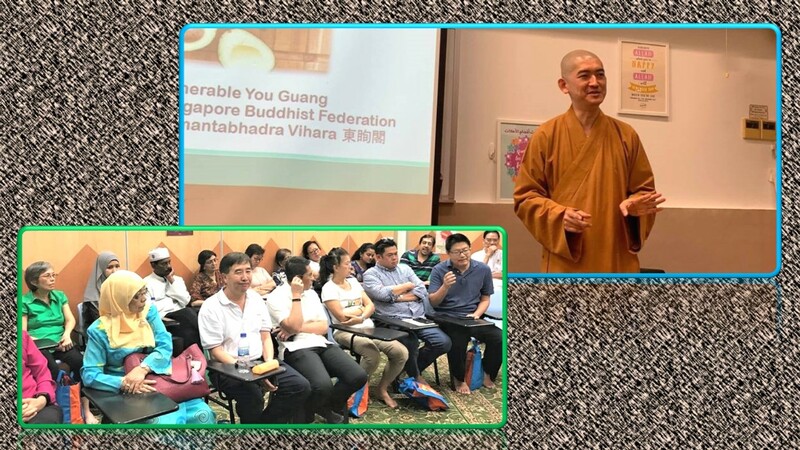 “Vegetarian and halal food” presentation for grassroots leaders: The first speaker, Venerable Shi You Guang explaining vegetarian food from the Buddhist perspective. “Vegetarian and halal food” presentation for grassroots leaders: The second speaker, Mr Shukul Raaj Kumar explaining vegetarian food from the Hindu perspective. “Vegetarian and halal food” presentation for grassroots leaders: The third speaker, Mr Shaik Kadir talking about Muslim food, known as halal food. 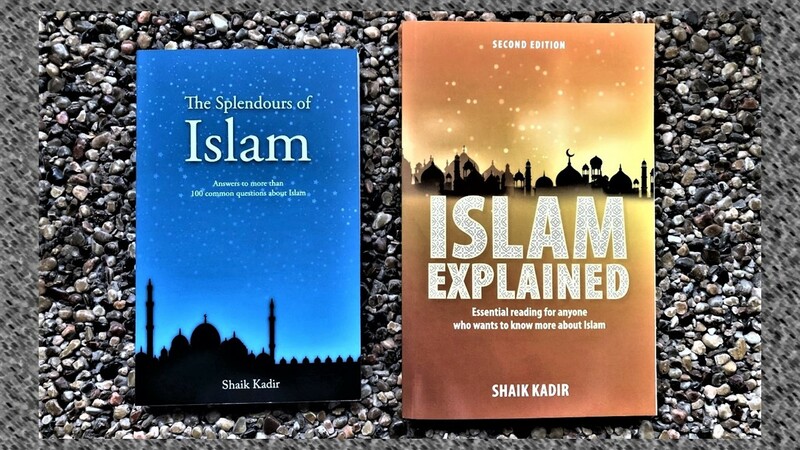 The “Halal food” speaker drew his presentation information from two of his several books on Islam: “The Splendours of Islam – Answers to more than 100 common questions about Islam”, published by The Muslim Converts’ Association of Singapore (or Darul Arqam Singapore); and “Islam Explained – Essential reading for anyone who wants to know about Islam”, published by Marshall Cavendish (Asia). The other talks in the “Workshops together with M3” event were on exam motivation and preparation, breast cancer and dental health. Some of the guests, including children, at the event. 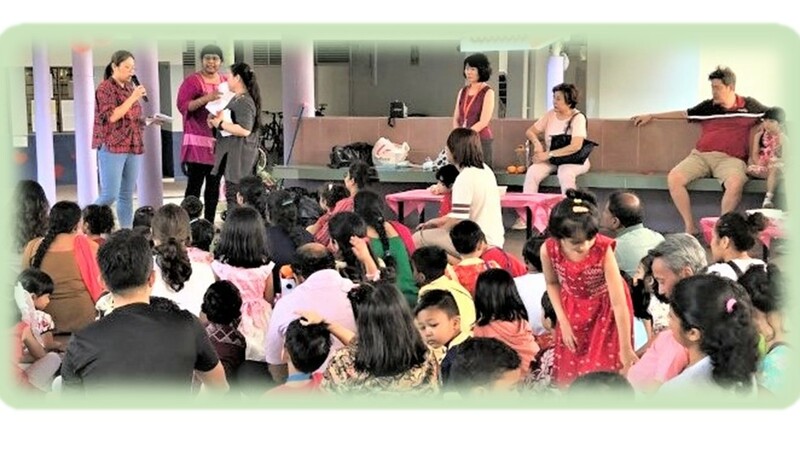 Some 100 residents, parents, students and grassroot leaders of the Siglap Constituency attended the event. 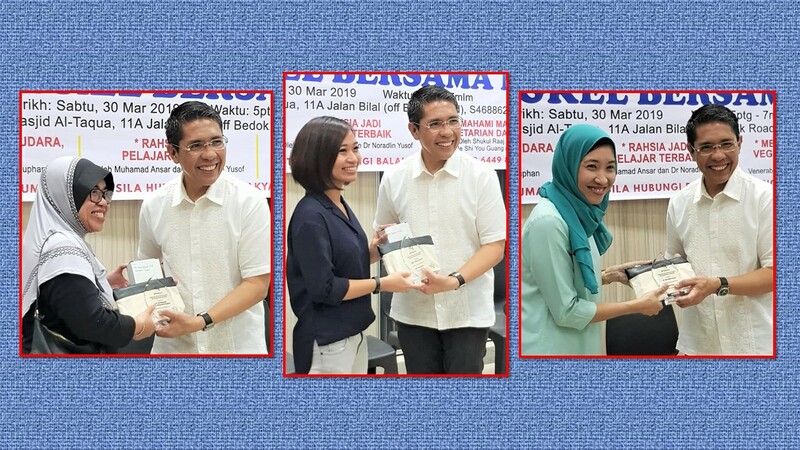 The Guest-of-Honour and advisor of the event was Dr Mohamad Maliki Osman, Senior Minister of State for the Ministry of Defence and the Ministry of Foreign Affairs, and Mayor of South East District. Time for a quick photo with the Guest-of-Honour Muhamad Maliki Osman. In his address, Dr Maliki highlighted the importance to continue strengthening the social cohesion of all Singaporeans. 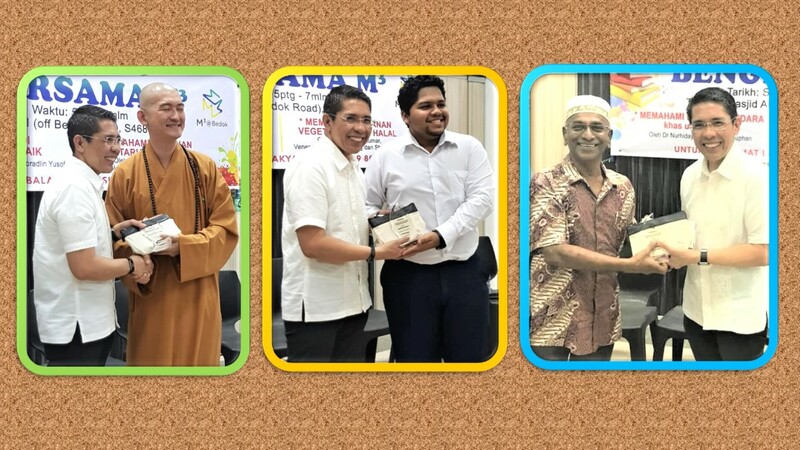 He encouraged the staging of more of such events with religious organisations, such as the mosque, to continue connecting with people of all races and religions in Singapore. Token of appreciation for the presenters at the Dietary Understanding and Restrictions workshop: From the left photo, Venerable You Guang, Mr Shukul Raaj Kumar and Mr Shaik Kadir. Token of appreciation for the presenters at workshops on preparing for exams, breast cancer prevention and dental care: From the left photo, Dr Nurhidayati Muhamed Suphan (Understanding breast cancer), Dr Ma Han Ni Tun (Importance of dental care) and Dr Noradlin Yusof (Motivating students and parents in exam preparation). 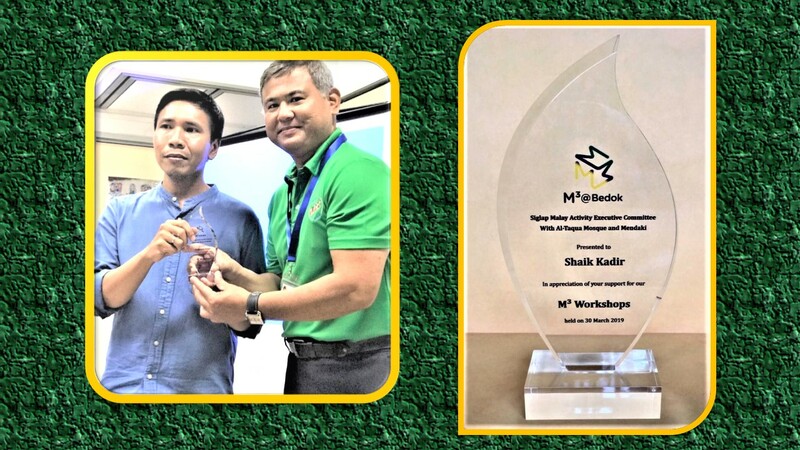 Muhamad Ansar from Mendaki, left, who talked on “Getting ready for PSLE”, had to leave before the appreciation token presentation by Dr Maliki, and so his token, like that shown in the other photo for Mr Kadir, was presented to him by an MAEC office-bearer, Mr Mohamad Jeffery Low, at the workshop hall itself. 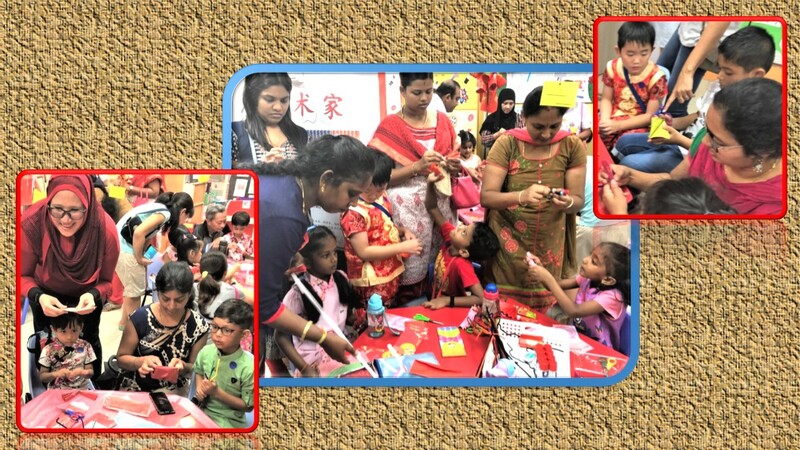 Mr Yacob Hussain, Chairman of the MAEC of Siglap Community Centre, said that the objectives of the event to provide relevant information for educational development and social awareness, and getting the residents come closer together have been achieved. 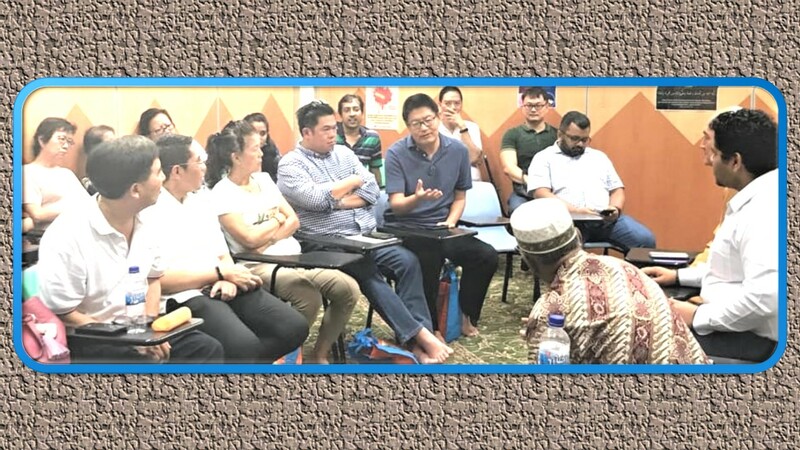 “Malay parents and students, and other residents as well as the grassroots leaders have benefitted much from the respective workshops they attended,” he said. It would be good for the Siglap Community Centre’s MAEC with the support of M3 and others to organise more such events, and to include inter-faith sharing talks on Singapore’s major festivals and celebrations such as Hari Raya Aidil Fitri & Hari Raya Aidil Adha, Deepavali, Christmas and Chinese New Year for our common good and deeper understanding of these yearly celebrations. Singaporeans value mutual respect and sensitivity. Let us uphold such values by further sharing the knowledge of our cultures and religious practices to further understand and enhance the racial and religious harmony that we have been enjoying. PS: The next article will be exclusively on halal food as this is an important topic on Dietary Understanding and Restrictions from the Islamic perspective which would be good for sharing, especially with non-Muslim Singaporeans, as we often eat together at Muslim wedding invitations and at social and office celebrations. “Assalamu-alaikum”. This is a greeting of peace in Islam. It means “Peace be upon you” It is the greeting of the Muslims at any time of the day or night. (The reply is “Waalaikum salam” which means Peace be upon you, too). It is heartening for Muslims to hear this greeting coming from a sincere non-Muslim. 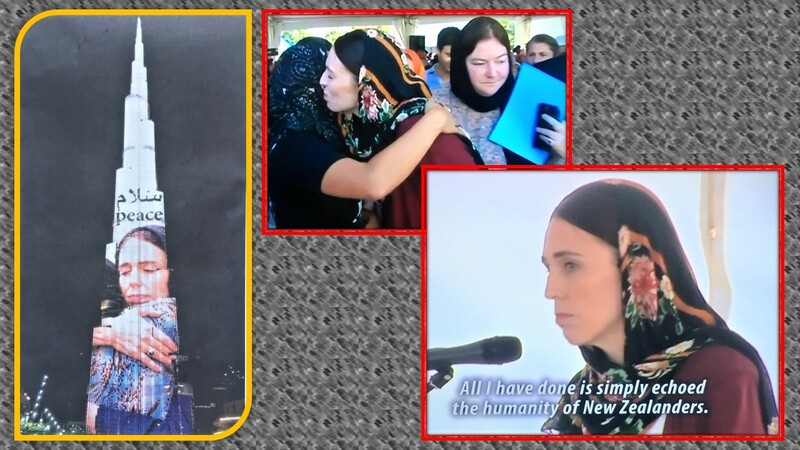 New Zealand Prime Minister Jacinda Ardern used this Islamic greeting in Parliament when she emotionally delved into the recent terror attacks at the two Christchurch mosques that killed 50 Muslims immediately and injured 50 others. 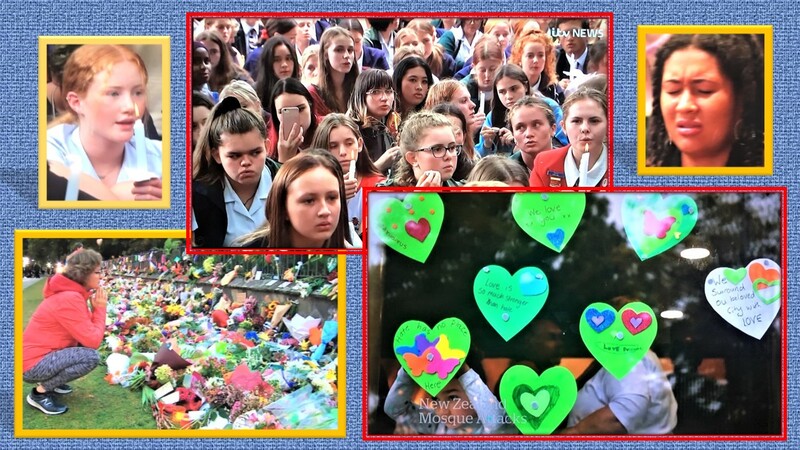 More than a week has passed since the brutal shooting tragedy in the New Zealand mosques, and during this time the world has surprisingly seen the natural inner beauty of the New Zealand people through their outpouring of emotion, support and love to the dead victims, the grieving ones and to all other shocked Muslims around the world. 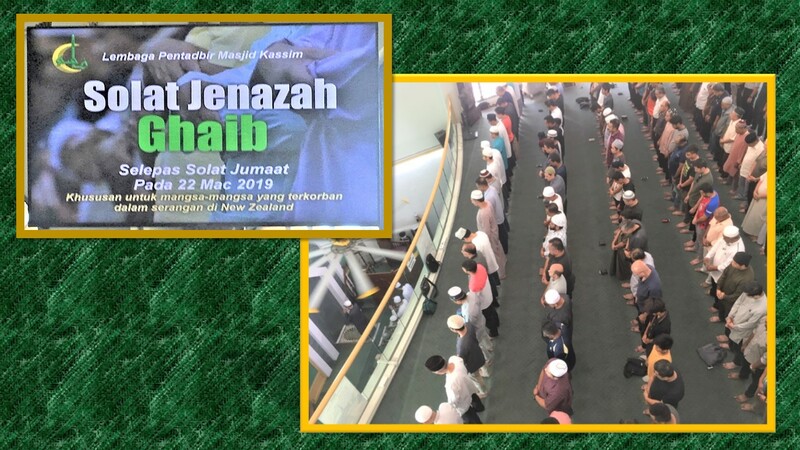 The focus is also on the country’s Prime Minister who called the day of the mosque massacre as “one of New Zealand’s darkest days”, and showed her affection in action by doing lovable and appreciative deeds. She banned gun sales and paid for the burial service of the fallen Muslims, donned the Muslim headscarf, gave prominence to the azan (Islamic prayer call), kissed grieving families, quoted from the Hadith (sayings and deeds of Prophet Muhammad, Peace be upon him, and greeted Muslims in the Islamic way: “Assalamu-alaikum” (Peace be upon you). 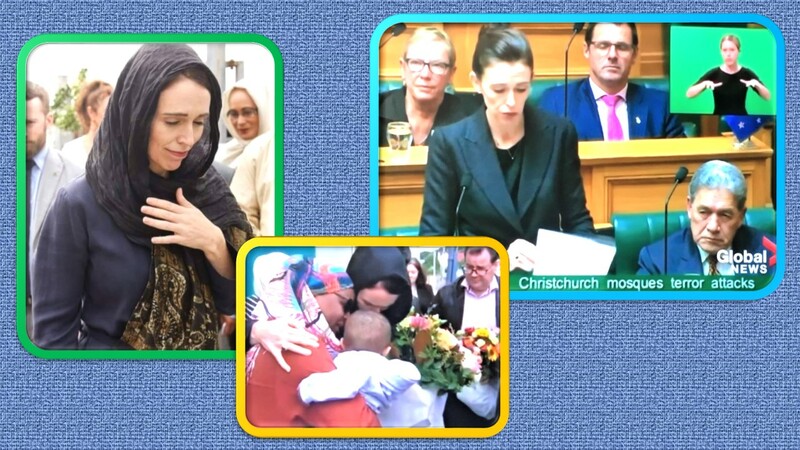 New Zealand Prime Minister Jacinda Ardern supporting the Muslims during their grief and denouncing hatred and terror acts. Consoling and supporting those who live to see their loved ones perish in the tragedy that killed Muslims while they were at prayer at the two Christchurch mosques, the New Zealand Prime Minister began her speech with the beautiful and meaningful Islamic greeting and said she finds it disgusting to mention the name of the person who murdered the innocents in those mosques, and indeed she did not mention his name throughout her address and said she would never want to mention his name. To most people of the world, Muslims and people of other faiths alike, the perpetrator, himself a foreigner in New Zealand, did a cowardly crime by gunning down unarmed people – the elderly, men, women and children – from their back while they were concentrated in their congregational Friday prayer in a mosque. He said that he did it because of the Muslim “invasion” of western countries but he was certainly unaware that numerous westerners have become Muslims, saying they converted to Islam because of its beauty and logic. Students dancing the Haka, a Maori way of showing disgust at wrongdoings and honouring the victims of the Christchurch mosques massacre. 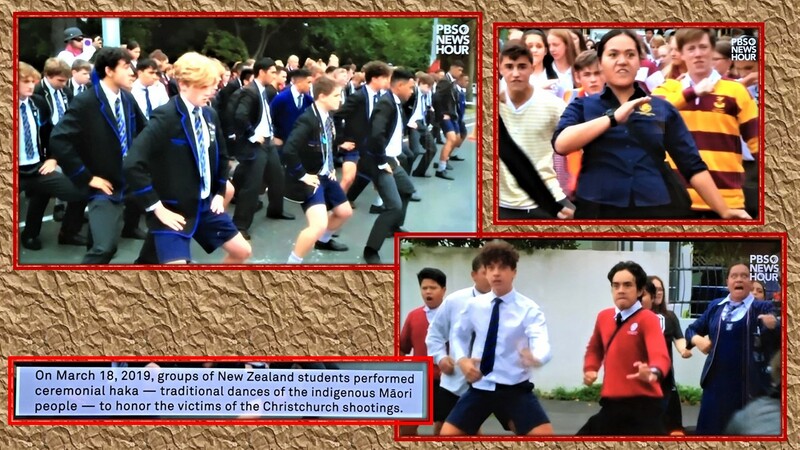 I am happy to see (on TV news broadcasts) New Zealand students performing the haka (Maori) dance to honour the victims of the massacre. 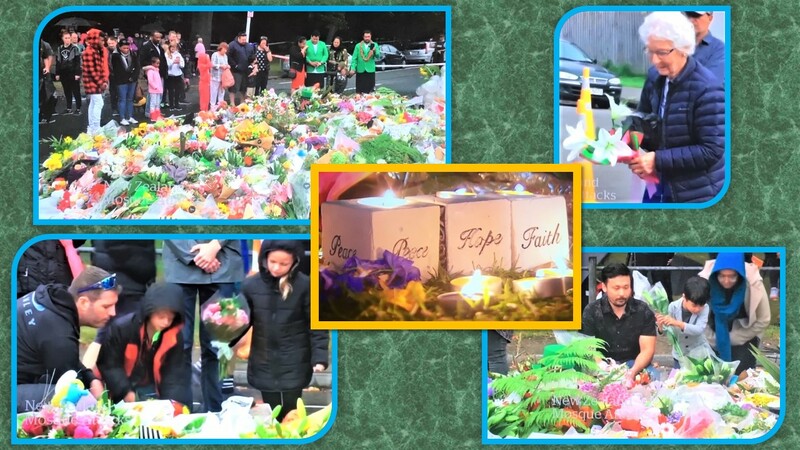 I also salute the tens of thousands of white New Zealanders who went to the two targeted mosques to offer condolences and laying flowers and candles at the sites and shedding tears of grief and sadness. Many hugged grieving Muslims, offering their support to them and condemning the depraved act of the gunman. Solemn days: Consoling the grief with flowers and candles. Solemn days: More flowers, candles, messages and tear. 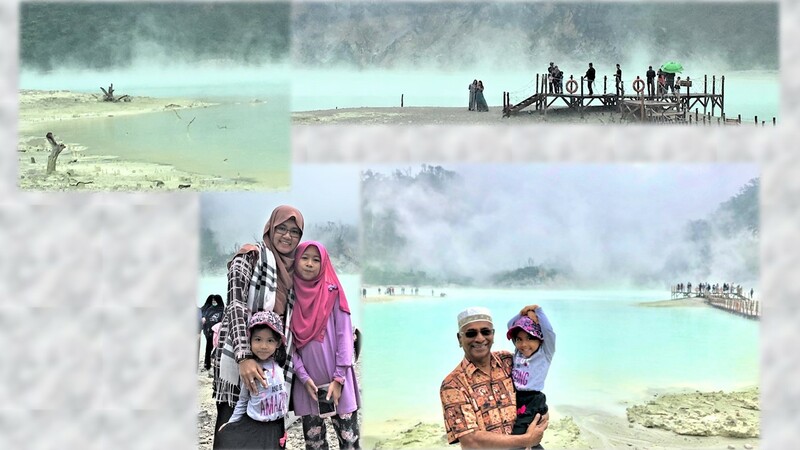 My wife and I, together with a few family friends, have been to that country (south island) some years ago. New Zealand is not only beautiful but also peaceful. 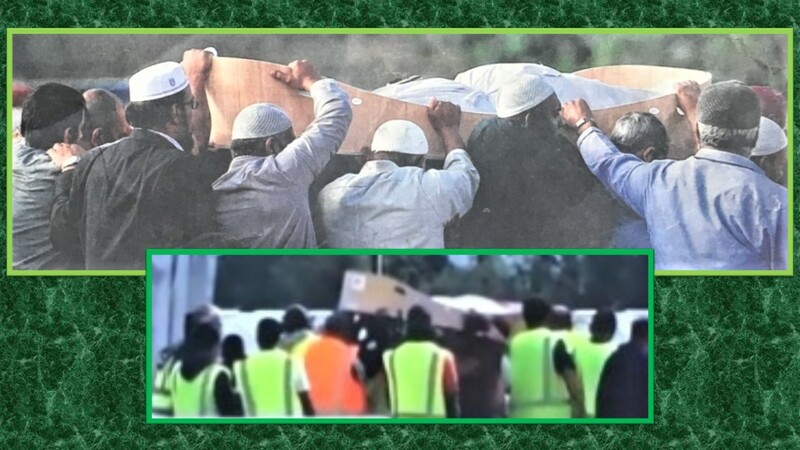 So it was not only a great shock to me but to New Zealanders themselves when the terrorist mowed down men, women and children when they were performing their congregational Friday prayers at the Al Noor Mosque and Linwood Mosque in the city of Christchurch. The affected Muslims received overwhelming condolences and support from around the world from Muslims and all the good people of other faiths. As for the perpetrator, his aim for heroic bravery and fame backfired. The opposite happened. Ms Jacinda Ardern shot to fame with her compassion and love for all people of New Zealand. She became the favourite heroine of the Islamic world with her adorable words and actions. Dubai, giving tribute to her even beamed out an image of a grieving Jacinda from the Burj Khalifa, the world’s tallest building. Ms Jacinda Ardern shot to fame worldwide and became the darling of the Islamic world with her adorable words and actions. Canadian Prime Minister Justin Trudeau, quoting the Qur’an, the Holy Book of Islam, said that Islam is a peaceful and compassionate religion, and that the depraved acts of some recalcitrant should not be blamed on the majority of peace-loving followers of Islam. In Singapore too, condolences poured in. 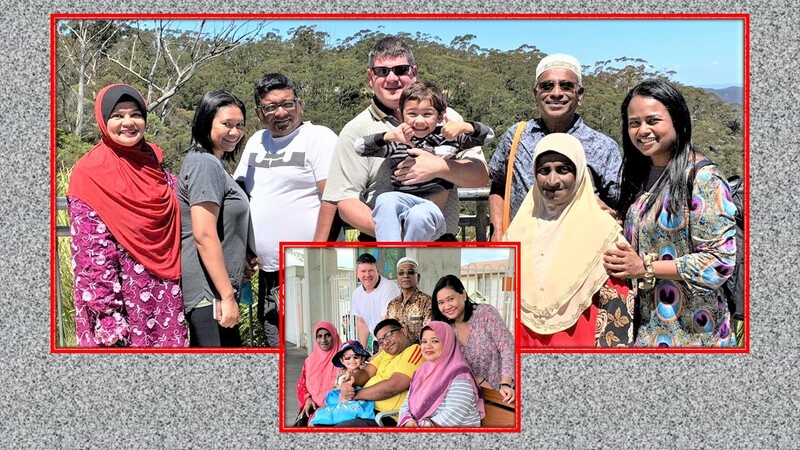 I am also greatly touched by the two New Zealanders who went to two different mosques in Singapore to show their concern to those killed in the two New Zealand mosques last Friday (15 March 2019). 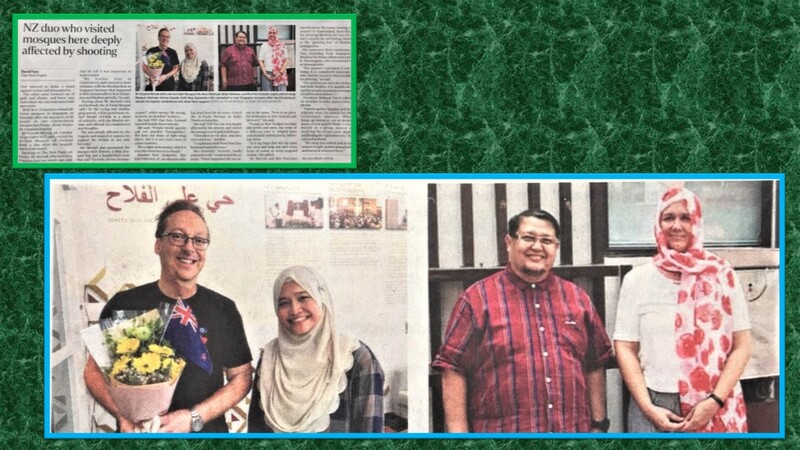 New Zealanders in Singapore deeply affected by the Christchurch killings visit mosques to offer their condolences: Mr Graeme Merrall (left in left Photo) with Ms Noor Khairiyah Abdul Rahman (mosque official) at Al-Falah Mosque, and Mrs Kim Forrester wearing the tudung or headscarf with Mr Azman Kassim (mosque chairman) at Al-Huda Mosque. 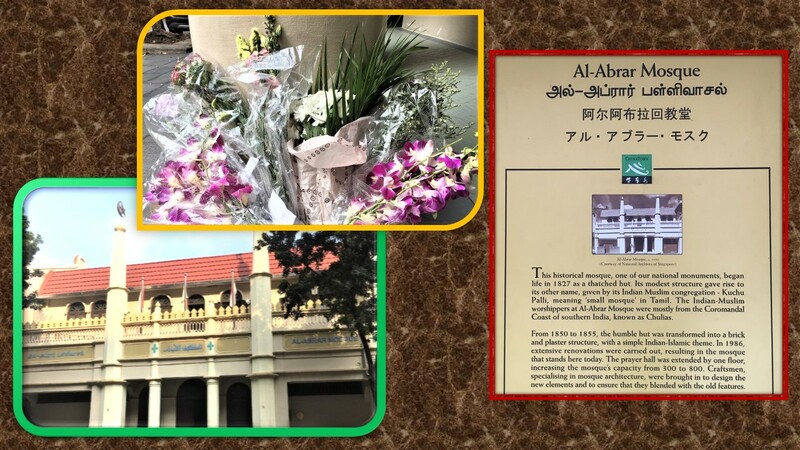 Masjid Al-Abrar (Al-Abrar Mosque) in Telok Ayer Street, built in 1927, is one of the Singapore mosques that received condolence flowers from non-Muslim well-wishers who showed their concern and love to Muslims. The photo on the left shows a full-page NZ Newspaper with an Arabic word that says “Salam” which means “Peace”, published a week after the mosque attack, with the names of the 50 persons killed mentioned at the bottom of the page. “Peace” in Arabic is spelt with three letters SLM or S for Sim, L for Lam-alif and M for Mim. 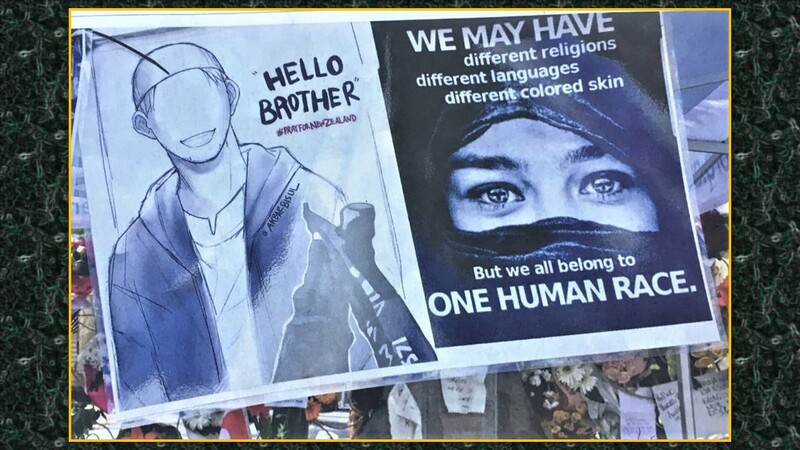 The photo on the right shows a common printed despatch that was often shared on WhatsApp to offer condolences in the Islamic way whenever relatives, friends or public figures pass away; in this case to the victims of the Christchurch shootings. It reads: “Inna lillahi wa inna ilaihi rajiun” (with a bit of variations in the spelling in English alphabet in some despatches). It is often uttered in a low voice to acknowledge God’s will, and the phrase simply means “From God we came and to Him is our return”. Singapore, as the world knows, is a beautiful country with its beautiful multi-racial, multi-cultural, multi-religious people living together in unity and harmony – all because Singapore does not allow hate speeches and hate acts to take place. Singapore justice comes hard on anyone attempting to disrupt the peace and harmony that is being enjoyed by everyone living in this small but no-nonsense nation. All countries in the world need to work together to eradicate terrorism, bigotry, radicalism, Islamophobia, terrorism and hate speeches. It is urgent – think of the children who will hate us adults if we pass the mess that we have created to them. As the world advances into maturity and civility, let us not go backward with narrow-thinking and destroy ourselves. Progress should mean in this civilised time as enjoying peace and harmony among all races in the country, and act fast to curb hatred and killings committed by the few zealots. All people of Muslim-majority and Muslim-minority countries around the world need to be united, supportive and loving to all races like what we are witnessing happening in New Zealand in the days since the mosque massacre. Salute to Prime Minister Jacinda Ardern and all New Zealanders for showing the enlightened way. Actually “Islam” means “surrender” or “submission” to Allah (the God), and “salam”, which means “peace”, is the root word of “Islam”. The word “peace” itself is mentioned more than 700 times in the Qur’an, the sermon stated. Flowers and messages outside Lakemba Mosque in Sydney: The emblem of Singapore is “Unity in diversity”, so should it be in other countries, too. A Muslim man, as portrayed in “Spotlight Humanity”, said: “Thank you New Zealand for showing the world how to deal with hate.” Indeed we agree. We need to spread the spirit of “Salam” (Peace) to the world and be Brother-in-Humanity. 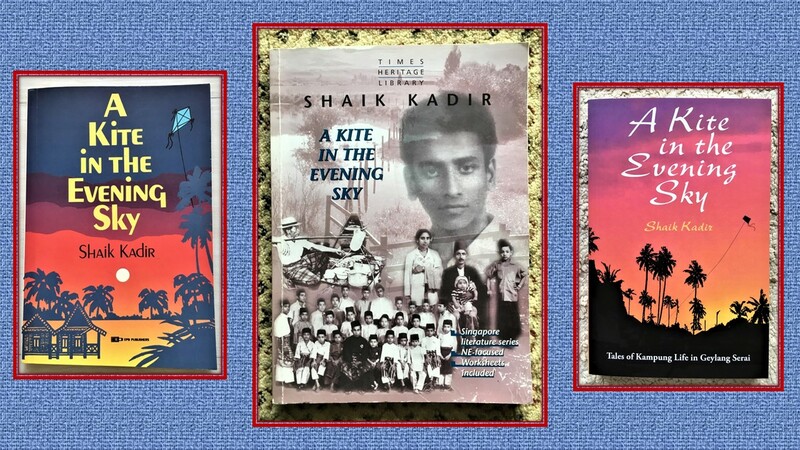 In the Malay Heritage Gallery of Wisma Geylang Serai, among the numerous old photos and Malay artifacts three quotations from my book, “A kite in the evening sky”, are prominently displayed in a clear covered case. The quotations are in their original English and by the side of each quotation the translations are given in Malay. 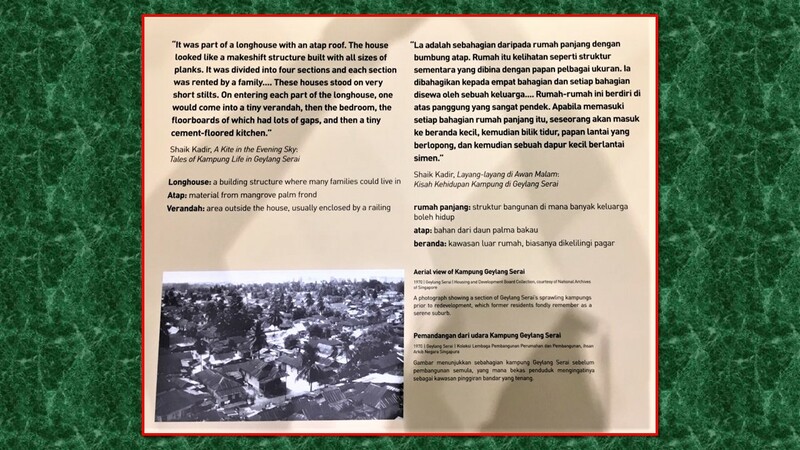 This is the first of the three quotations exhibited at the Heritage Gallery of Wisma Geylang Serai. The quotation was taken from Page 14 of the book. 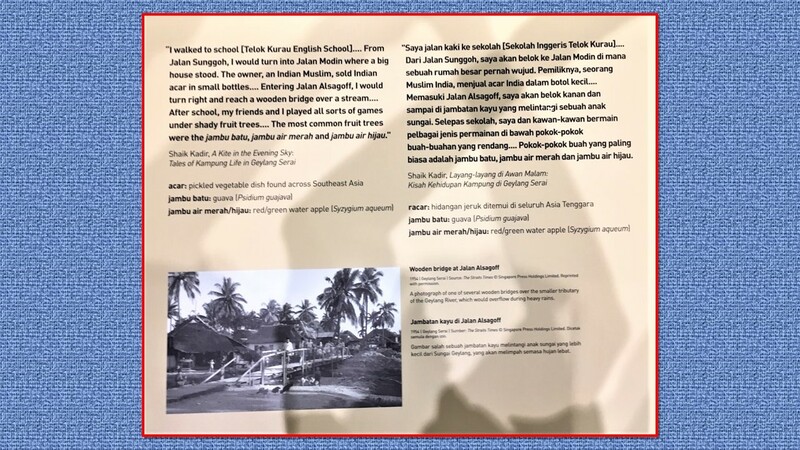 It tells about the sights I saw during my daily walk from my (first) home, a rented room, deep in Geylang Serai to and from my school (Telok Kurau Primary School) in Telok Kurau Road. The second of the three quotations. It was taken from Page 19 of the book. The quotation talks about my new home. F or cheaper rent, we moved to a room in an attap-roof long house in Jalan Alsagoff. The jamban was a shared bucket-collected toilet located a short distance away from the longhouse. The third of the of the three quotations. 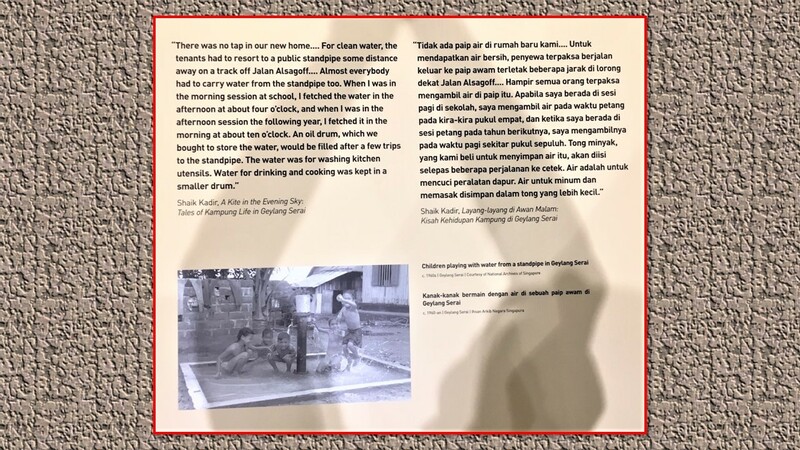 This quotation, taken from Page 21 of the book, tells that there was no tap in this longhouse and that I, with a pail in each hand, had to fetch water from the government standpipe some distance away. Geylang Serai usually refers to the area along both sides of Geylang Road-Changi Road stretch bounded in an area on one side by Jalan Ubi near where the Kembangan-Chai Chee Community Hub (formerly a school) stands and on the other far side by Tanjong Katong Road near where the Tanjong Katong Shopping Complex is located. This is a bustling area, an area not only for shoppers but also a nice area to roam around to enjoy its sights and sounds and eat or even just sit at one of the many restaurants to chat while sipping teh tarik (pulled milk tea). In Ramadan (the Muslim fasting month), the area is aglow with decorative lights and attractive decorations and the bee-hive bazaars therein attract people from every part of Singapore. The place where I lived till 1969 is roughly in the present-day Eunos Road 5. That is to say, Geylang Serai in those days extended beyond the present Sims Avenue, accommodating a large area of Malay kampungs (villages). It would be interesting to know what stood at the sites of some of the present buildings of Geylang Serai exactly 60 years ago, in 1959, the year when Singapore gained self-independence from the British. That year (1959), I was in Primary 6 at Telok Kurau Primary School and, at weekends, I roamed around this “town” area to see the posters and photos of “Now showing” and “Next change” movies at Garricks and Taj cinemas. Let’s now get into the Geylang Serai Time Machine and go back to that year – 1959 – and take a walk in Geylang Serai, starting from one side of Geylang Road-Changi Road stretch from the present City Plaza and ending after walking in a loop, at the present Tanjong Katong Complex. 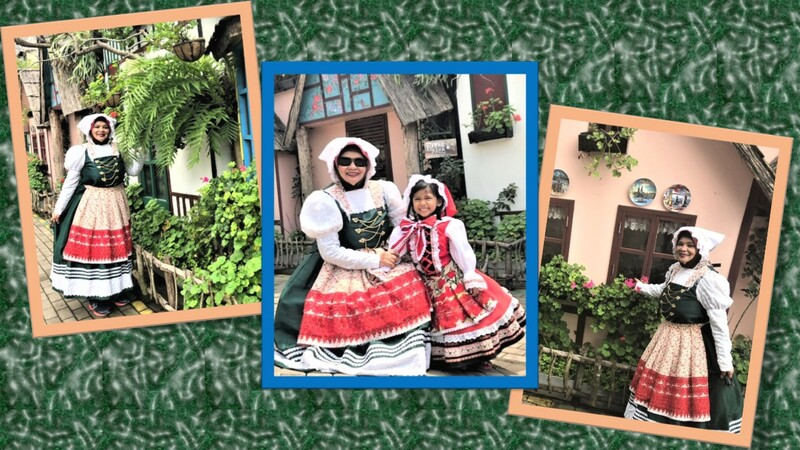 Yes, we would be amazed at how Geylang Serai has modernised but its old spirit has remained to make the present generation appreciate it and the old generation remember it. Ignoring most of the shops and eateries along both sides of the Geylang Road-Changi Road stretch of Geylang Serai, let us focus only on the landmarks of those days. The present City Plaza was a curved building of two-storey shophouses in 1959, and from here when we walk down, we pass by the front of two two-storey blocks of homes for government officers known as the Haig Road Government Quarters (present Haig Road Hawkers Centre), then we reach the Garricks cinema (present Muslim Converts’ Association of Singapore or Darul Arqam Singapore) and beside it the Onan Road Mosque and soon we come to the Changi Market and behind it the Joo Chiat Market (the present Joo Chiat Complex). Walking further down, we reach Lorong 101 Changi, and from this spot we cross Changi Road to come to an area spread with make-shift food hawkers, then we come to the Taj cinema (the present Millage condo) and the Eastern World Amusement Park behind it. Then we come to the Geylang Bus Terminus (at present, the Geylang Serai Market) where we see petrol buses and electric trams (bus tanduk which mean buses with horns) with their two connectors touching the overhead electric cables. Suddenly, just after a tram left the terminus and made a curved turn in front of the Changi Market, one of the connectors of the tram got disconnected with the overhead electric cable and the tram stalled. Both the tram driver and the tram conductor rushed out, and skilfully by manoeuvring the hanging aiding rope positioned the connector to the electric cable and rushed back into the tram to proceed with the journey. No crowd gathered to watch the scene as dislodging of the connectors is a common sight. Then, walking further up at the site of the present Wisma Geylang Serai, we see rows of shops and two coffee-shops with Indian Muslim food stalls. The shops included a Malay bookshop, tailor shop, a barber, to mention just a few. And some steps away, a row of shophouses accomodates a few shops, including a flour mill, a well-known Chinese medical hall, Afghanistan restaurant and wooden clog shop. A few steps away is the Hawa restaurant and a short distance further up we see an area piled up with planks and sawn wooden beams – it’s a building material shop. A little further up, we see a big Malay house raised above the ground. It is actually an Arab association. Attached to its side, on the ground level, is Nor Radio, a shop selling radios, whose owner is the uncle of my close friend, Ramli Hamid. Now we stand on the five-foot way of a row of shophouses at the site of the present Tanjong Katong Complex, having completed a loop. Yes, this area in those days were bustling with people as it is today. Many of these 1959 scenarios are shown in my book, “A kite in the evening sky”. 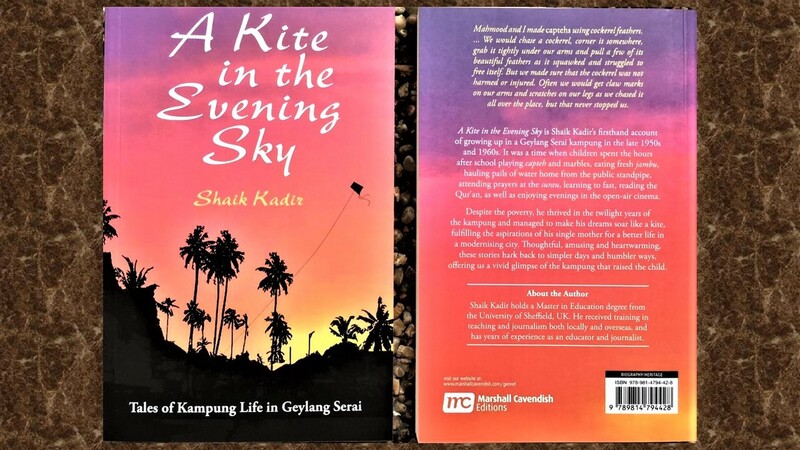 A Kite in the Evening Sky is a firsthand account of growing up in Geylang Serai. I moved to a rented room of a kampung house in Geylang Serai from Telok Ayer Street in the city after my father passed away when I was seven years old. That was in 1953. Why was I using crutches? What happened to my family? “A kite in the evening sky” was first published in 1989 by EPB Publishers. 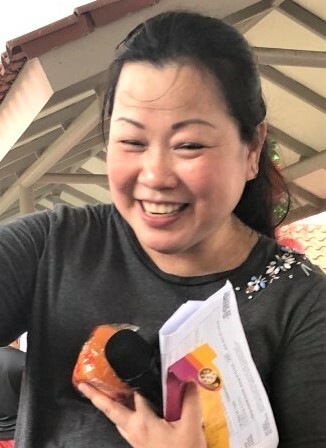 In the year 2000, the book was republished by Federal Publications under Times Heritage Library in “Singapore literature series” and became one of the secondary school literature books. In 2018, the book was republished by Marshall Cavendish International for worldwide sale. The three paces (1989, 2000 and 2018) of A Kite in the Evening Sky. https://singapore.kinokuniya.com/bw/9789814794428 as well as in Popular bookstores. In Malaysia, the books are available in Kinokuniya KLCC and Popular Malaysia stores. Online, the book is available over all Amazon platforms, The Book Depository and Fishpond World. 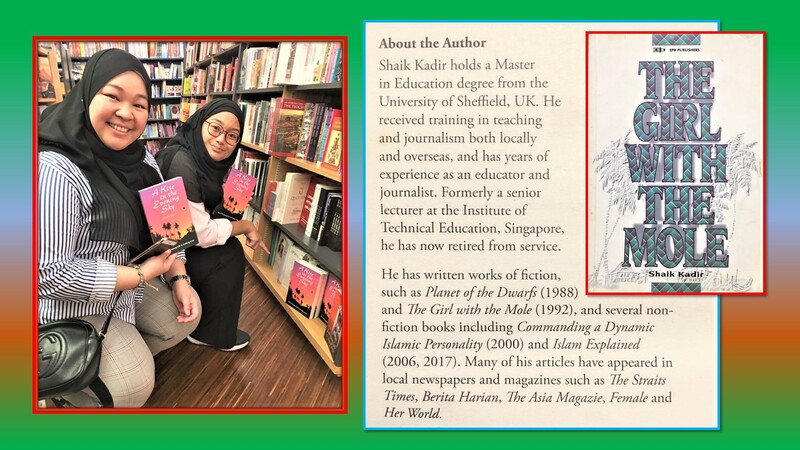 At Kinokuniya bookstore, Orchard: Farah (left) and Nadia, both from Brunei Darrussalam, each purchasing “A Kite in the Evening Sky”. The “About the Author” appears on the last (inside) page of the book. Overlapping the photo in this page is a photo of another of my Geylang Serai book, “The Girl with the Mole, an anthology of nine short stories, published by EPB Publishers in 1992. 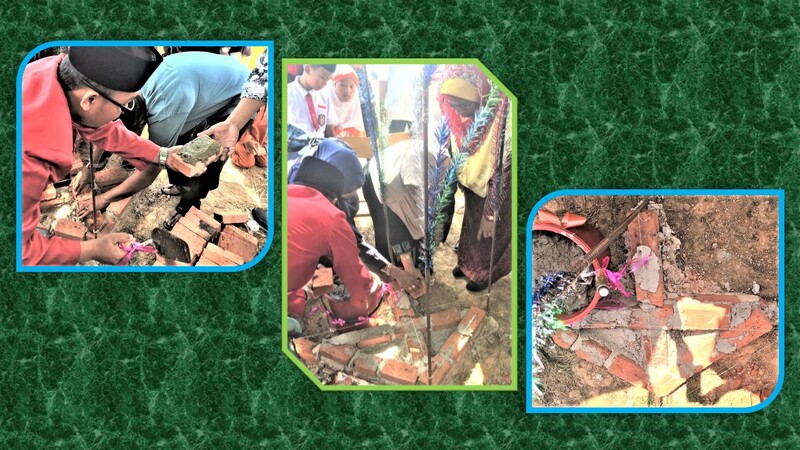 A number of Singaporeans who donated for the building of a mosque in Batam, Indonesia, were among the many Indonesians who witnessed the planned mosque’s foundation-laying ceremony on Saturday, 8 February 2019. 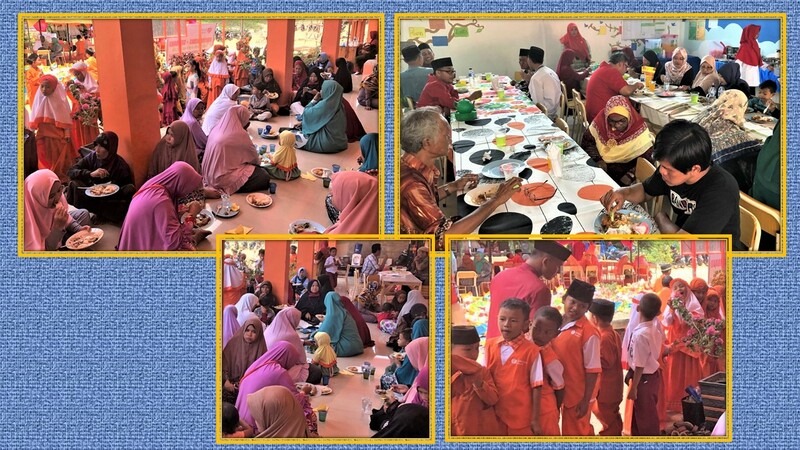 Singaporeans have also been donating towards the building of a two-storey primary school for poor children and orphans under the administration of Rumah Zakat, a welfare organisation in Batam. 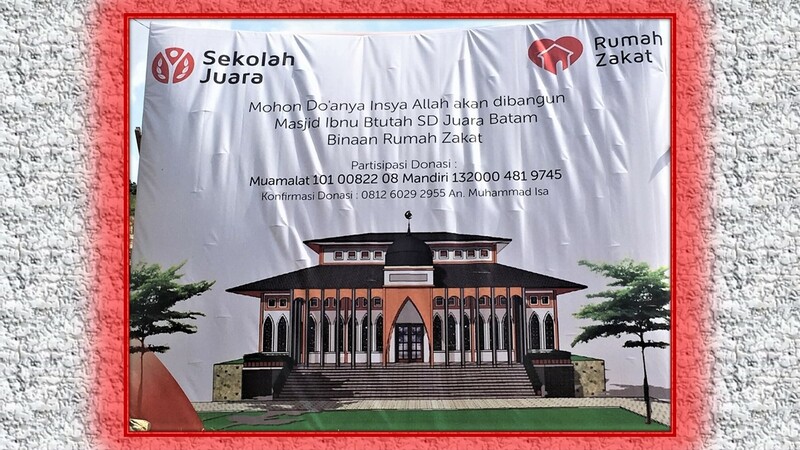 The half-completed school, called “Berkualitas SD Juara Batam”, is located less than 300 metres away from the site of the proposed mosque in the same land compound. For the moment, the students of the school, about two dozens of them, are attending classes at another location. However, they were all present at the exciting mosque foundation-laying event to welcome the guests and make presentations. Mr Muhammad Isa, Branch Manager of Rumah Zakat (in red shirt), together with the pupils of Juara Batam school welcoming the guests from Singapore. 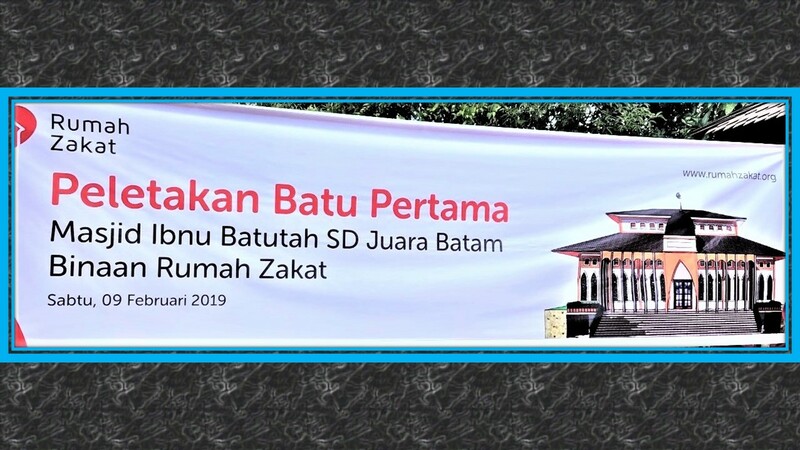 A banner announces the laying of the foundation of the soon-to-be-built Ibnu Batutah Mosque. The mosque was named after the 14-century Moroccan scholar and explorer, Ibnu Batutah (often spelt as Batuttah). The famed Muslim, who had not only performed his Haj (pilgrimage in Mecca) but also, in 30 years, had travelled across Africa, Middle-East and Asia, documenting his travel experiences. 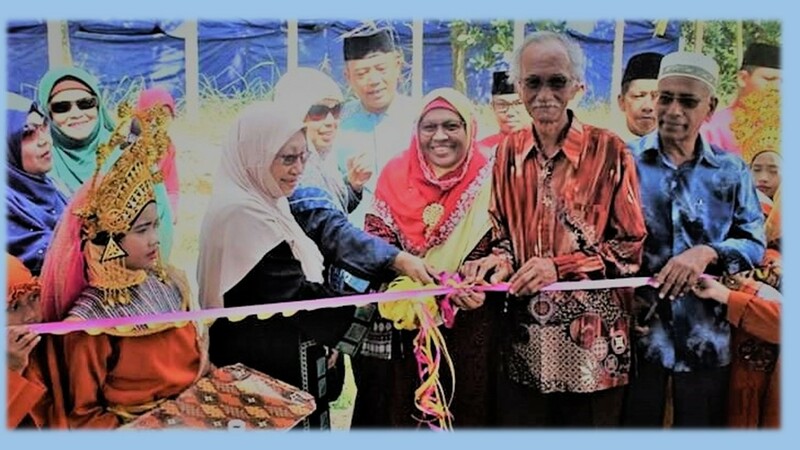 Indonesian officials and Singapore liaison officer, Halimah Bee Abdul Kader (in red headscarf) and her husband, Mr Jonit Ibrahim (in bright brown batik), as well as the other Singaporean guests at the ribbon-cutting ceremony for laying of the foundation of Masjid Ibnu Batutah (Ibnu Batutah Mosque). Mr Muhammad Isa helping the officials and Singapore guests in laying cemented bricks to form an arrow indicating the Qibla (Muslim prayer direction that points towards the Ka’aba in the Grand Mosque in Mecca). 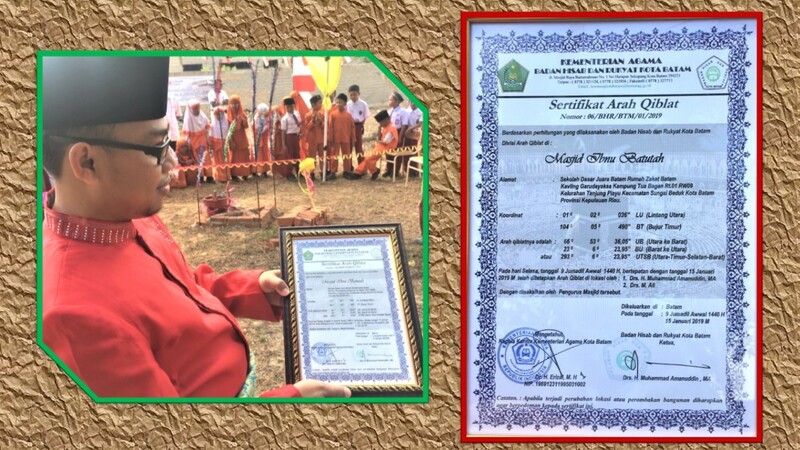 The certifate shows that the Qibla has already been determined in January 2019. Watching the mosque’s foundation-laying formalities. 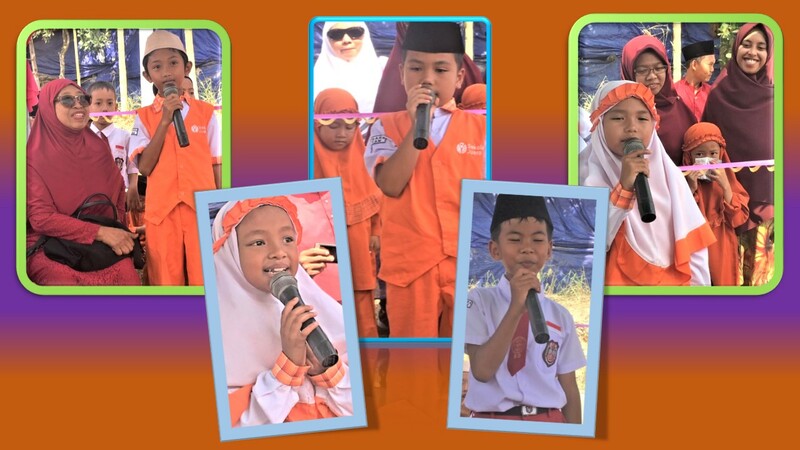 Pupils of the Juara Batam school, who are between 8 and 12 years old, delivering short speeches in English, one of language subjects they are taught in school. 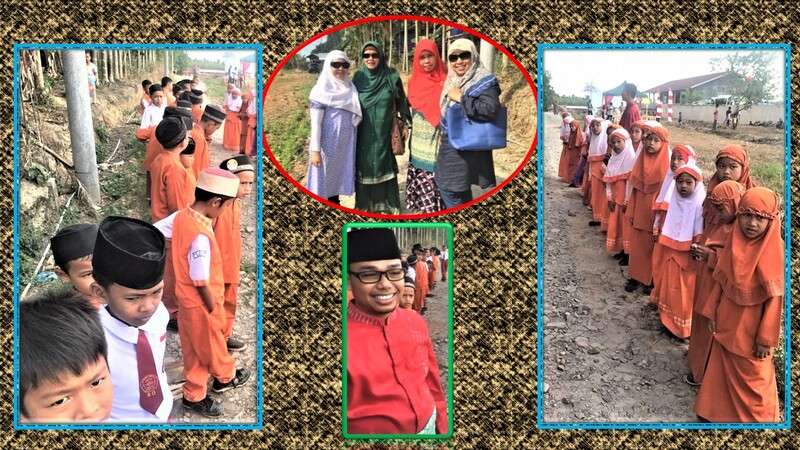 After the doa (supplication for the building success of the mosque) and the children’s presentations, everyone walked to the front of the half-completed school building just a stone’s throw away in the same compound where a stage has been erected for speeches and performances. 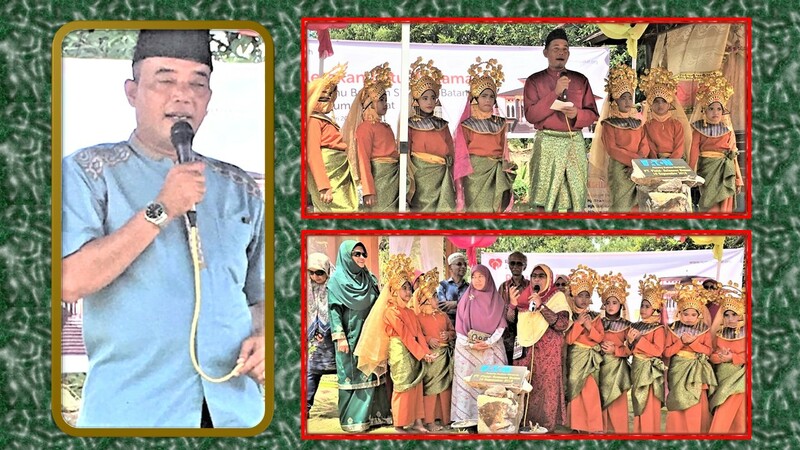 Delivering the speeches are, from left, Mr Ghufron, Mr Shofar Fitrotul Al Amin (red shirt) and Mdm Halimah Bee Abdul Kader together with the school’s pupils in Indonesian ceremonial attire. Performances and religious recitations by the children of the school. Some of the Singaporean guests taking photos with the pretty little performers. 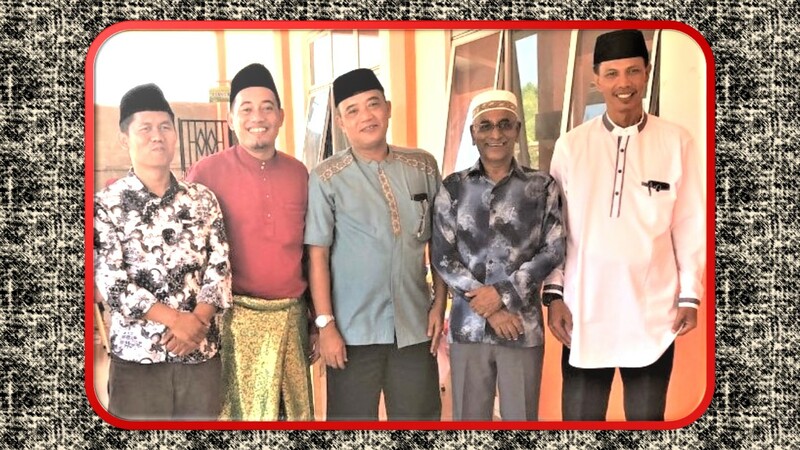 Writer of this article (fourth from left, in dark batik) with officials of the ceremony: From left are Mr Syamsul Rizal, Mr Shofar Fitrotul Al Amin, Mr Ghufron and Mr Ruslan (religious teacher, in white attire). A lunch for everyone present ended the day’s exciting event. On the first floor of the 2-storey half-completed school building: After the tom yam lunch, the children lined up to get their favourite delight — ice-cream. 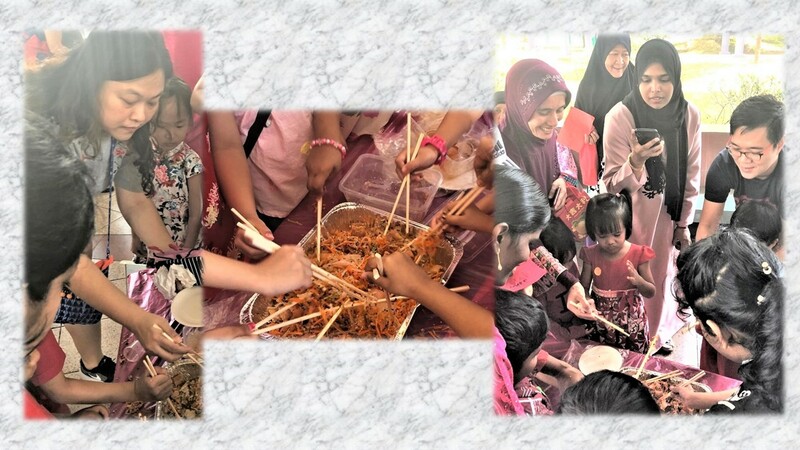 The Singapore ladies with Batam ladies, mostly mothers of the school’s pupils, who had volunteered to cook and prepare the delicious tom yam lunch for the guests and everyone present. 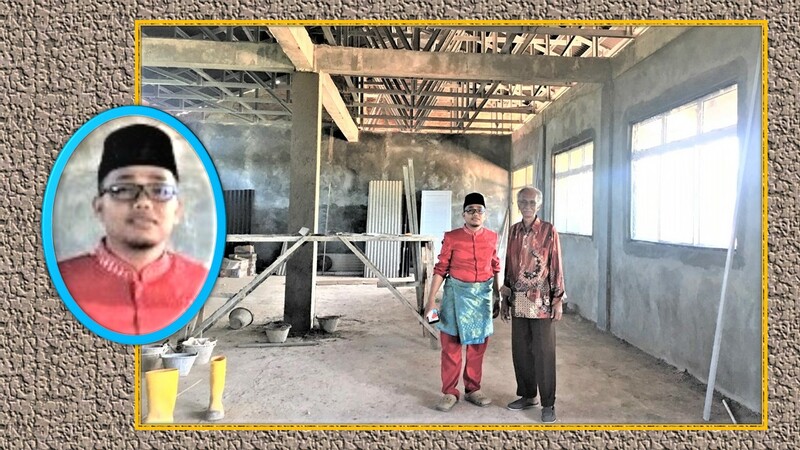 At the second-storey: Mr Muhammad Isa says the second storey of the school building will be completed by July, and thanks all donors, Indonesians and Singaporeans, for their donations and motivation given towards the building of the school and the mosque. Mr Isa was happy to have the Singapore guests at the foundation-laying ceremony. “They motivate us in our objectives of building the school and the mosque and in supporting our efforts in education,” he said. 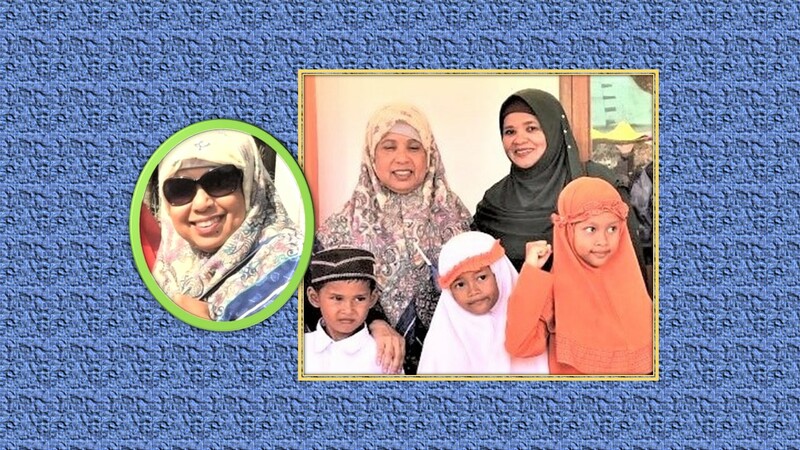 Mdm Halimah has three married children, all doing well in their respective employment. They are happy that she loves charity work. Her husband, Mr Jonit Ibrahim, too, are supportive of her ideals. 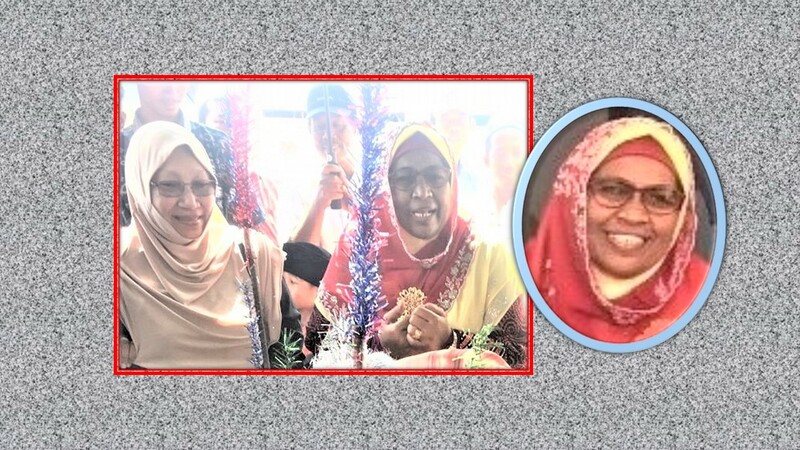 She is a happy grandmother of ten grandchildren, the eldest being a polytechnic graduate. 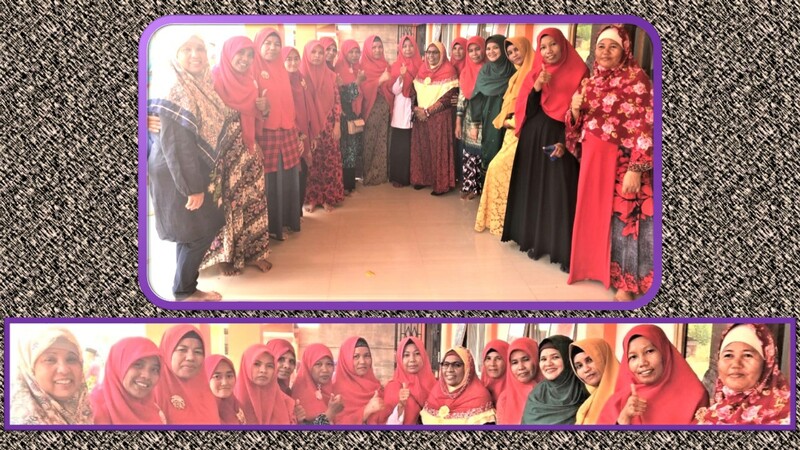 Mdm Jaiton Mohd Mastan is among the Singaporeans who has been donating regularly towards the building of the primary school. “I love children, especially poor children and orphans. Our donations will help them meet their daily basic needs and in their education to develop them to be useful adults later on. Helping them gives me much happiness,” she said. The banner gives instructions on how to make donations towards this good cause. With the completion of Masjid Ibnu Batutah within three years, and the completion of the second storey of the school, the area will be busy and become an educational hub for people living in the area. 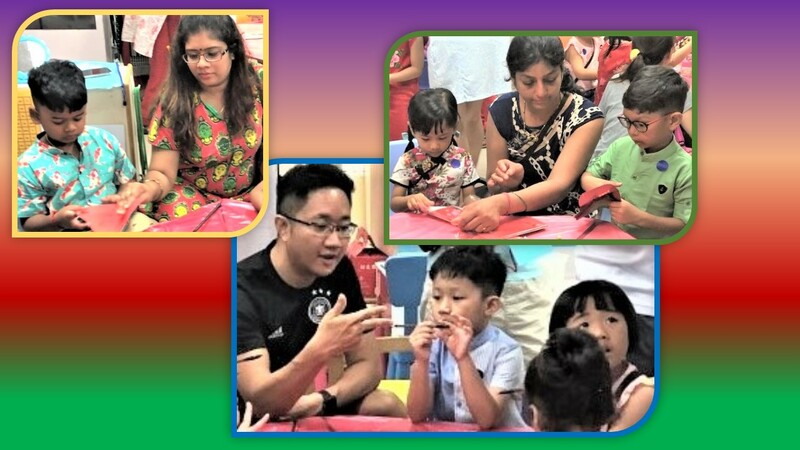 Monday, 4 February 2019 was a special day for the pupils of PCF Sparkletots Preschool @ Kampong Chai Chee Blk 135. 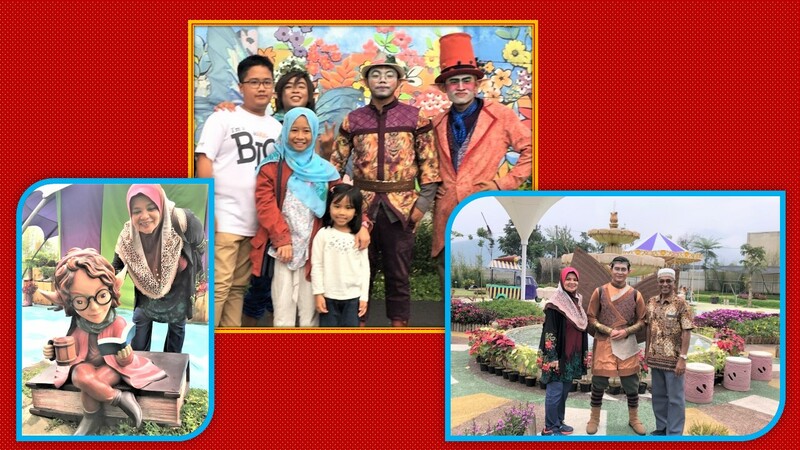 The children as well as their parents or their guardians who accompanied them had a wonderful time bonding together by participating in the performances and various activities arranged for the half-day. Almost all the pupils discarded their distinguished white-and-red unit and instead came in traditional Chinese attire or close to one. 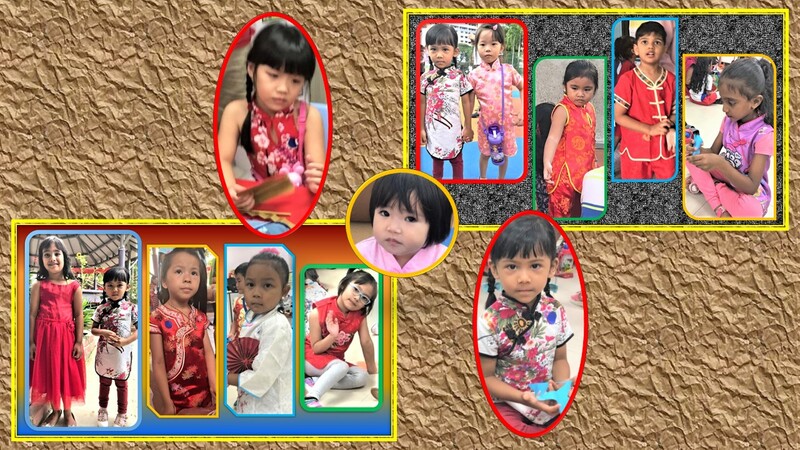 My granddaughter, Nur Iffah Bte Muhammad Imran, is one of them, wearing a while Chinese-styled blouse and red long pants. 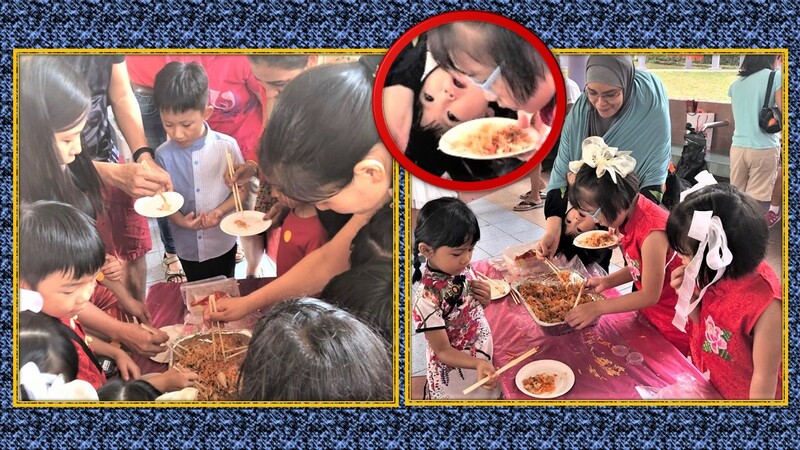 The morning programme started with the singing of the national anthem and stage performances and ended with “Yu Sheng” (also spelt as “Yusheng”), a fish-vegetable dish, and eating it. 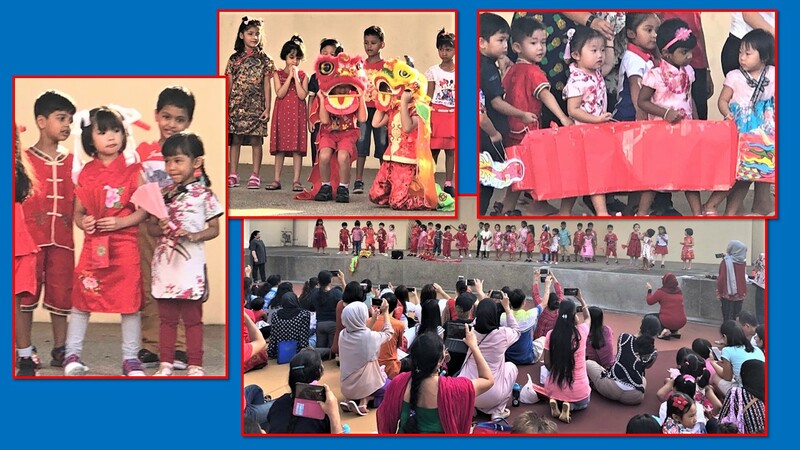 On stage at the Pavilion close to the preschool, pupils from the four levels – Nursery (N)1, N2, Kindergarten (K)1 and K2 – sang and even did a mini-lion dance to the excitement of and applause from the audience. A mini-lion dance is among the presentations being enjoyed by the adults who are capturing every move made by the young-presenters with their handphone cameras. 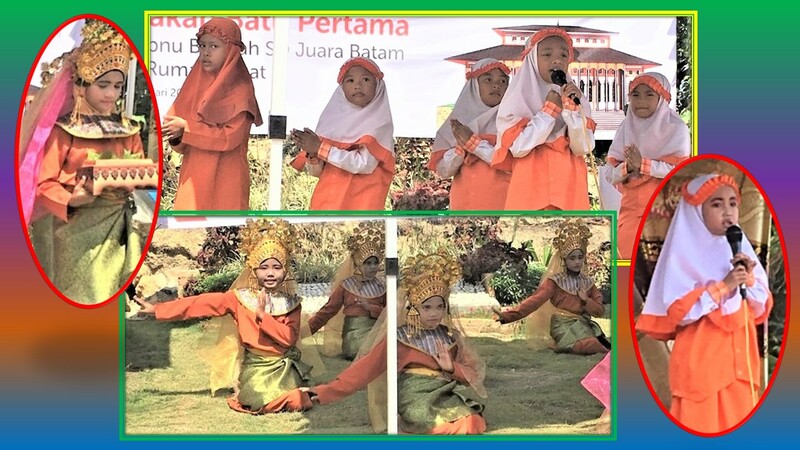 Iffah (in first photo, extreme right) is also participating in this vibrant dance item. The large audience being given some Chinese style respectful gestures for their attention and applause. 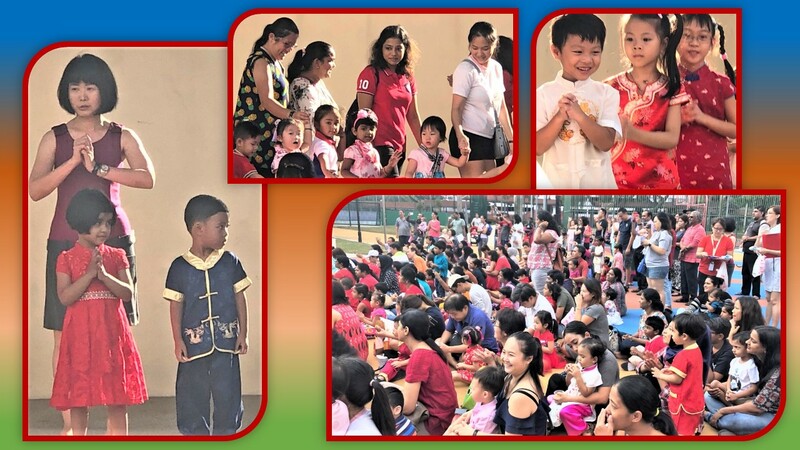 After the stage performances ended, while still in the Pavilion arena, in the spirit of the Singapore Chinese tradition, the children greeted their parents or guardians and exchanged the gifts given to them earlier for this event. 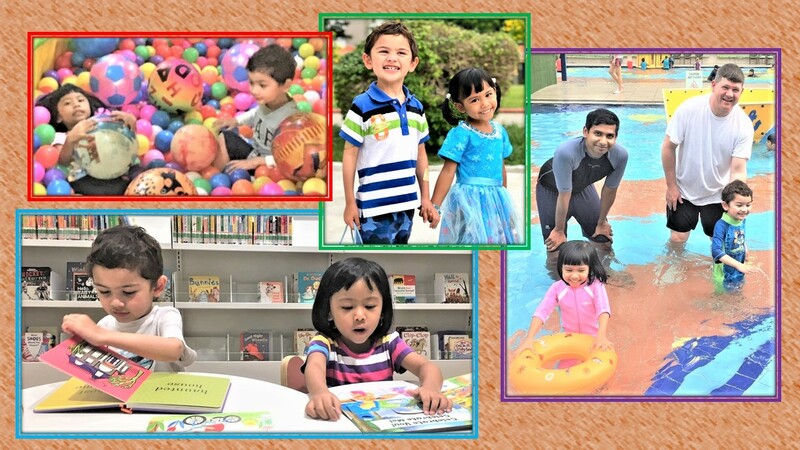 The main objective of the activities in the classrooms is parent-child bonding. 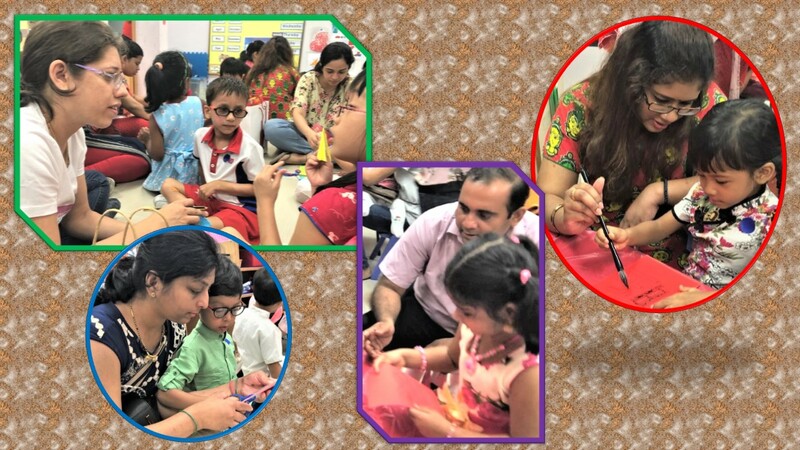 The children and the adults together participated in three creative activities with paper. The children get involved in making patterns with colour paper. No fear, the adults are there to give a helping hand to the youngters. More encouragement from the elders made the children not to give up in their endeavour. 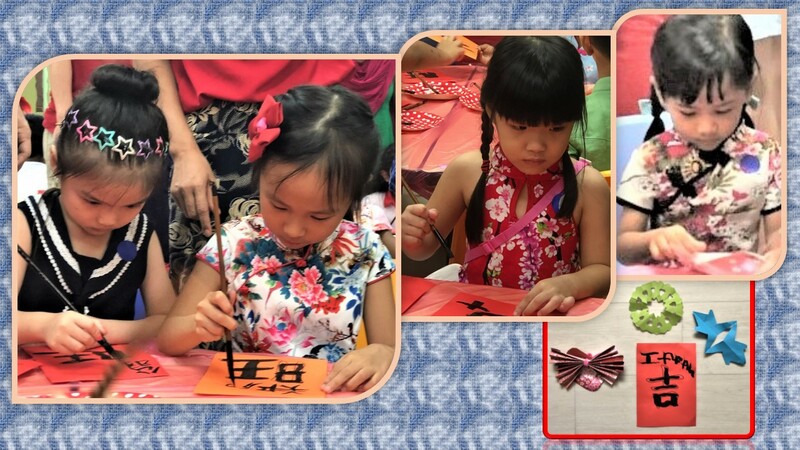 Four items were completed, including writing a Chinese character with a brush. “Gong Xi Fa Cai to the parents, guardians and children. 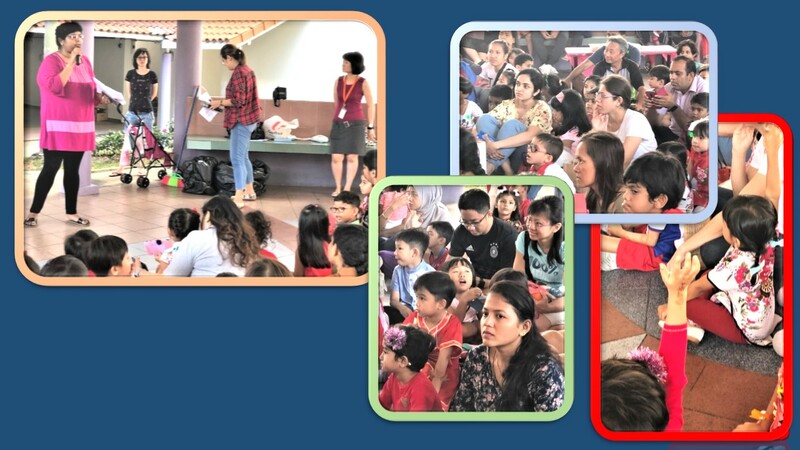 We, staff of PCF Sparkletots Preschool @Kampong Chai Chee Blk 135 (KN), thank you for your continuous kind support to the children and the school. We always believe in the famous African proverb ‘It takes a village to raise a child’, thus, let’s work hand-in-hand to provide quality learning to our little ones. 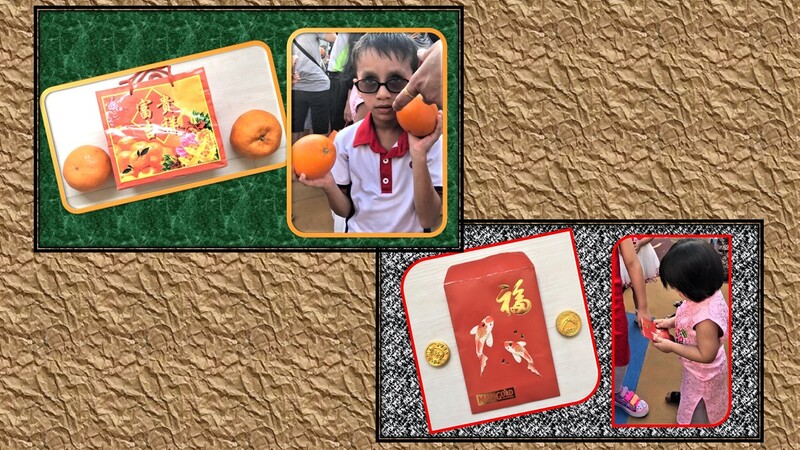 At the covered pavilion, the children as well as the adults learned about the months of the Chinese calendar and the significance of the Chinese New Year practices like presenting the mandarin oranges and red packet and the family reunion dinner on eve of CNY. 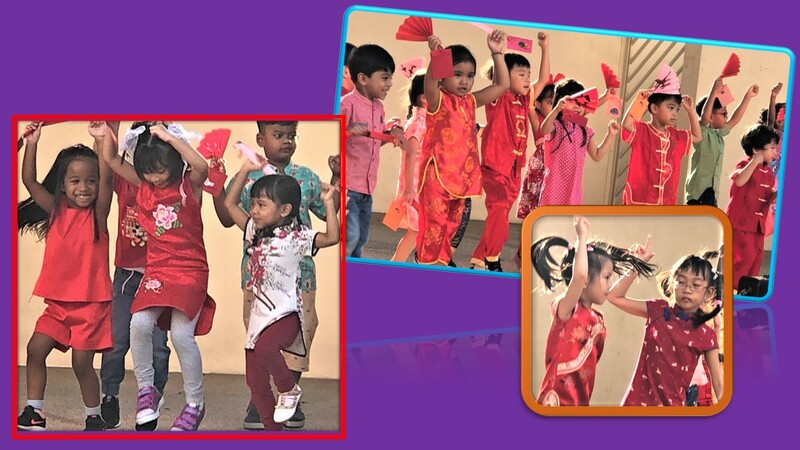 They also learned that the CNY greeting can be “Gong Xi Fa Cai” or “Xin Nian Kuai Le”. A talk by the staff on simple practices of the Chinese culture. Many children, including Iffah, (extreme right photo) raised their hands to answer questions on some aspects of the Chinese culture. 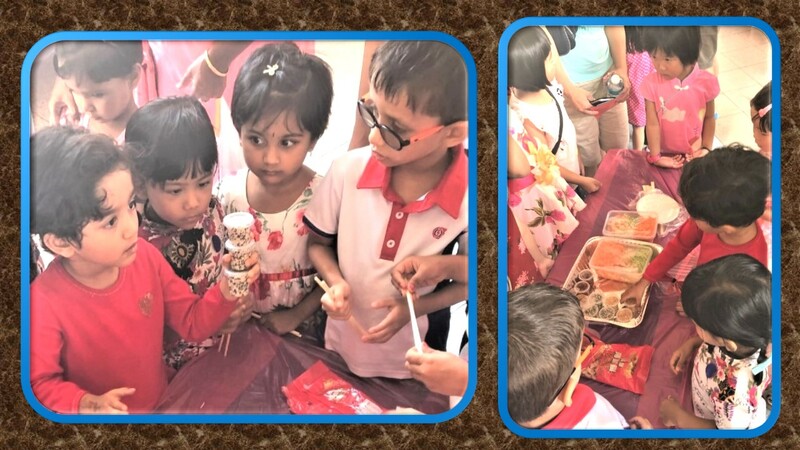 After the talk by a couple of teachers and Mrs Ruth Neo-Lim, low tables were placed for the attendants to participate in Yu Sheng. Yu Sheng (also spelt as Yusheng) or lohei is actually a “Prosperity Toss” of raw fish salad that consist of shredded fish like salmon and vegetables like carrots. The practice is actually a symbolic gesture of prosperity and happiness. Yusheng has already been done and tossed. Now it it makan (eating) time. Even the baby (photo enlarged in the circle) wants to eat it. 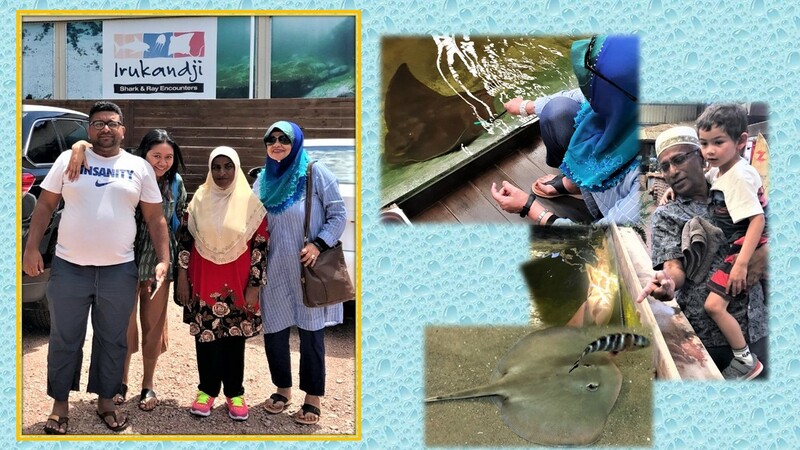 My granddaughter, Iffah, had the opportunity to meet up with and interact with her classmates as well as those from the other classes. 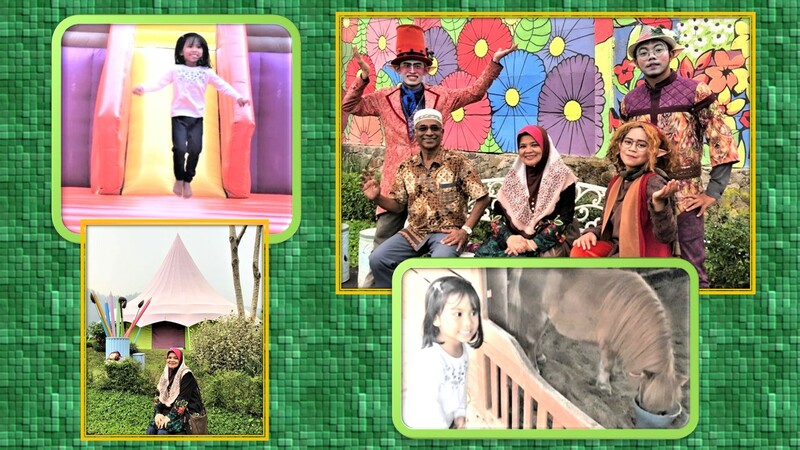 The pupils of the preschool and the adults who accompanied them enjoyed the celebration with the little ones. 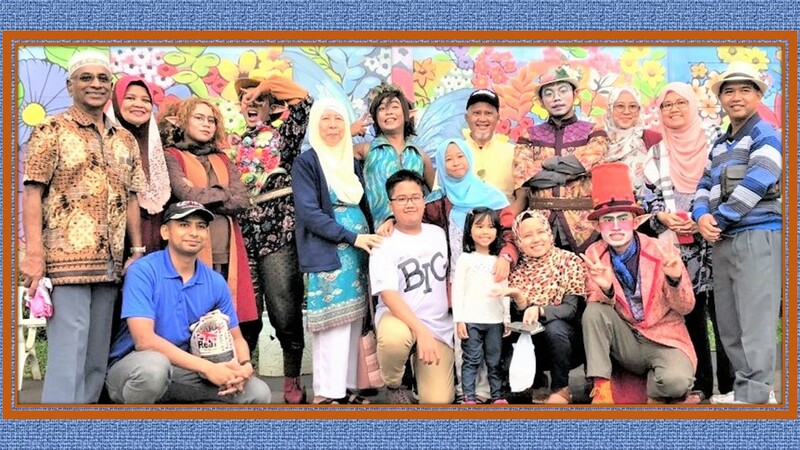 This is the true spirit of multi-cultural Singapore for all its people to enjoy the celebration of each of their festivals and learn from them so as to live peacefully together and build a progressive Singapore. My granddaughter even took photos with the principal and teachers of the school. 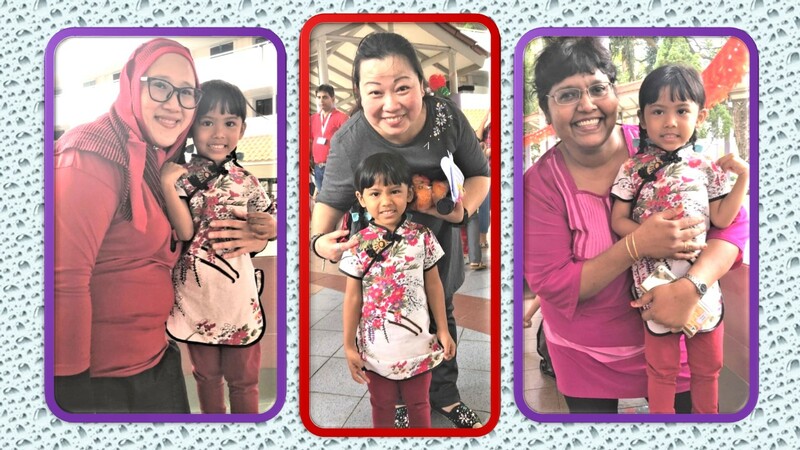 (Photos from left), Iffah with Teacher Norlela Dollah, Centre’s Principal, Mrs Ruth Neo-Lim, and Teacher Suraya Hanifa. 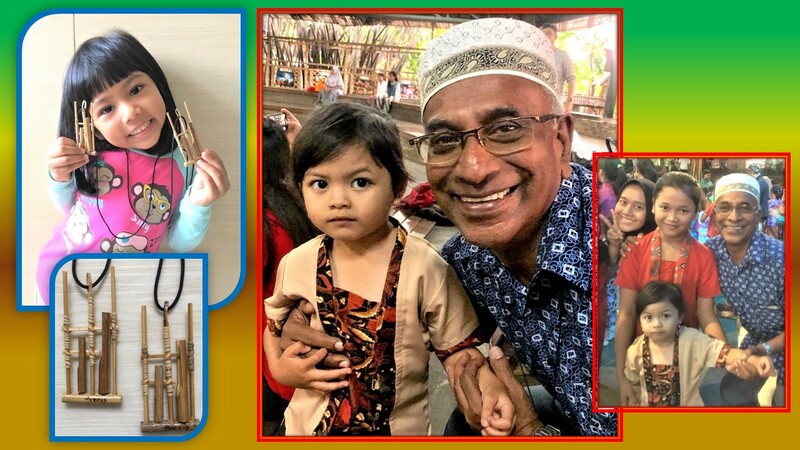 On behalf of my granddaughter, Iffah, I greet her Chinese friends, all pupils, the teachers and Principal Ruth Lim and all parents and guardians “Xin Nian Kuai Le” (Happy New Year). 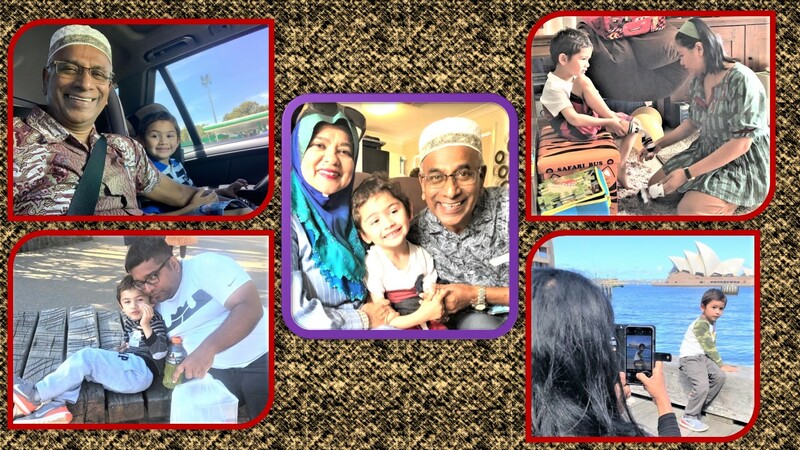 In December last year (2018), my wife and I had the opportunity to be in two cities – with Iffah in Bandung and Adam in Sydney. 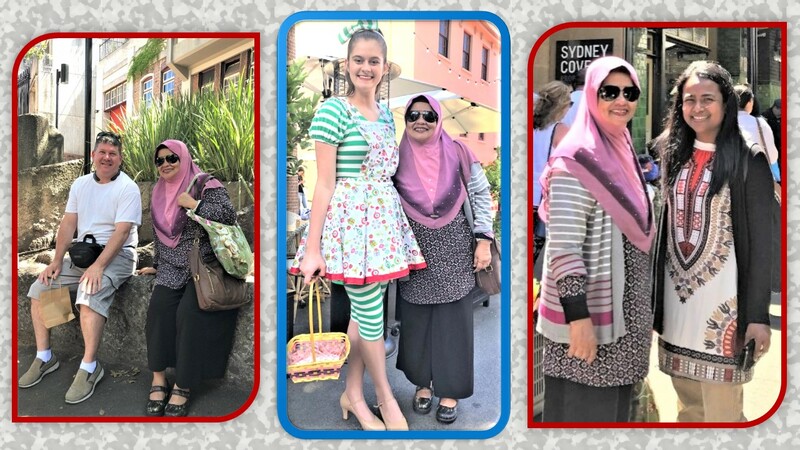 Adam (in Sydney) and Iffah in December 2018 and both together in Singapore in December 2017 (middle photo). 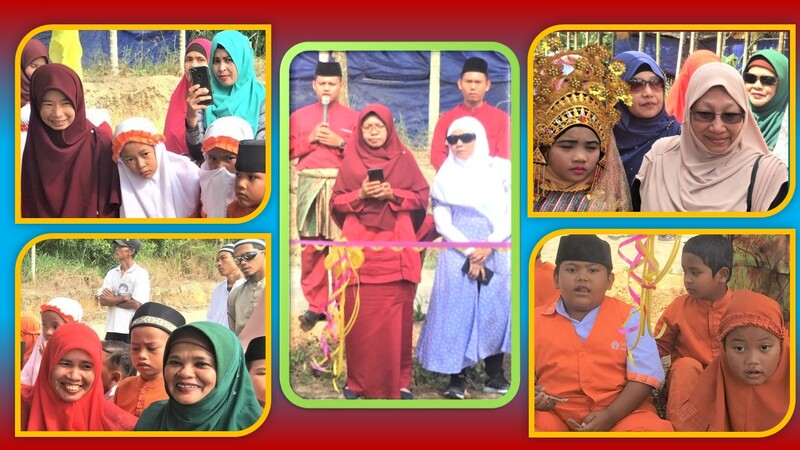 Adam Rayan Dula and Nur Iffah Binti Muhammad Imran are my two grandchildren – 5-year-old Adam is the son of my daughter, and 4-year-old Iffah is the daughter of my son. 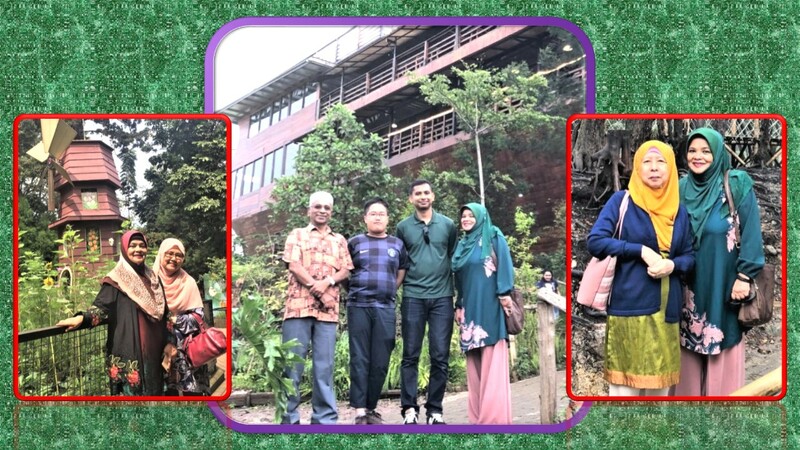 We went to Bandung for a short holiday with Iffah and her parents and relatives, an 11-member group, termed “Keluarga” (Family). 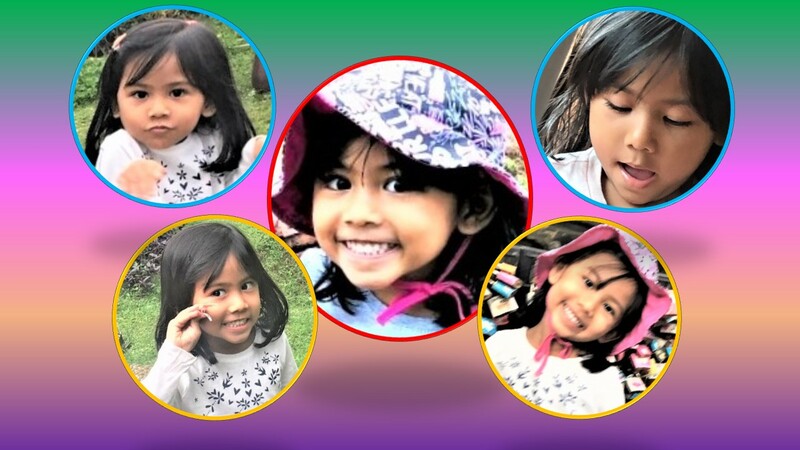 The group, in the 6-day Bandung trip from 10 December, included three children, the other two being Iffah’s older cousins. A day later after we returned from Bandung, my wife and I left on 17 December for Sydney for a 12-day holiday to be with Adam and his parents who are staying there as my daughter is working as a science education researcher in a university, the same university where she graduated with a PhD (in Physics education). 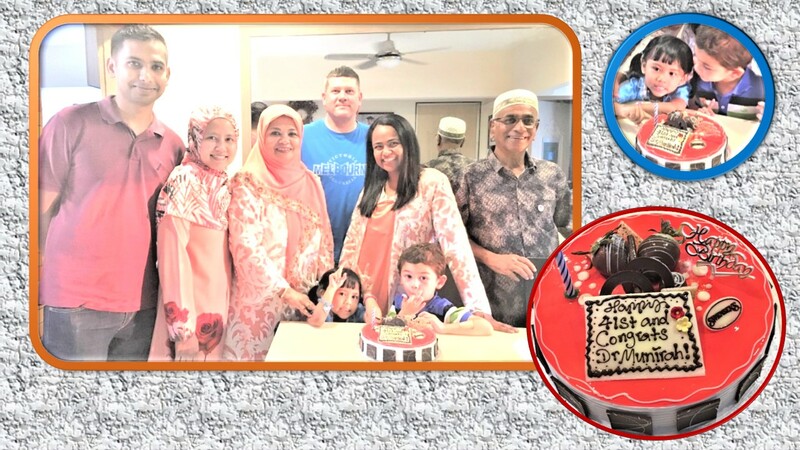 A few days before 17 December, my nephew, his wife and his mother had flown in to Sydney to meet Adam. 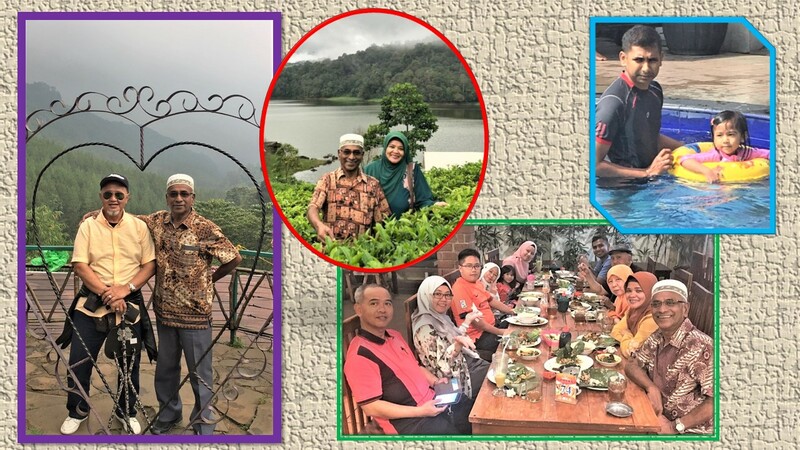 My wife and I couldn’t go together with them as we were in Bandung at that time. They returned to Singapore on Christmas day but we stayed on for a few more days. 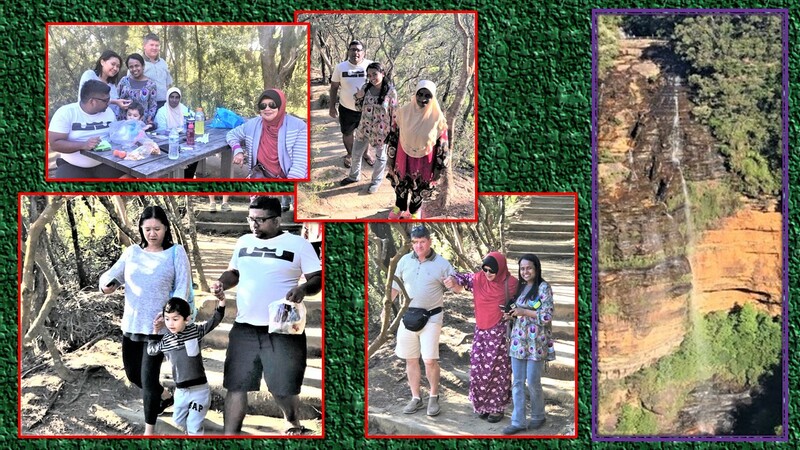 As a photo is worth a thousand words, the following photos presented in slides provide a good image of our holiday with Iffah and Adam. 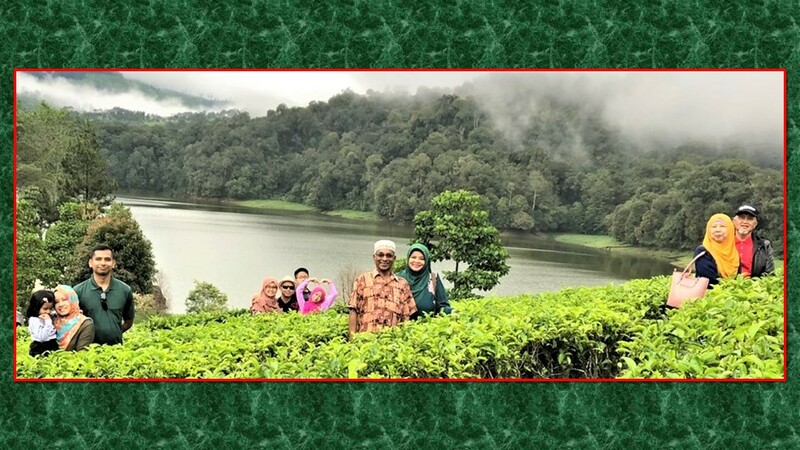 The 11-member “Family” at Patenggang Lake in Bandung: From left, Iffah and her parents, Shuhaila and Imran; Iffah’s cousins, Bill Haque and Arinal (in red headscarf) and their parents, Rashima and Zuhal; Iffah’s paternal grandparents, Shaik Kadir (Atuk) and Khairon (Nani); and Iffah’s maternal grandparents, Salama (Nenek) and Sidik (Atuk). 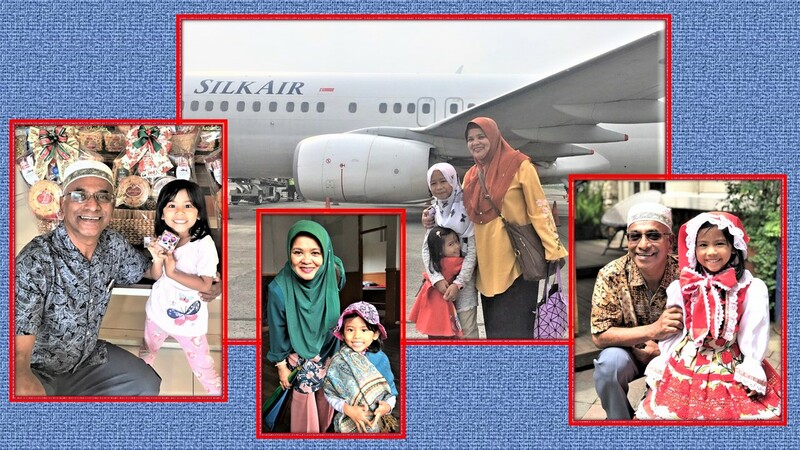 After touch-down from the Silkair aircraft in Bandung, Iffah’s fun began. 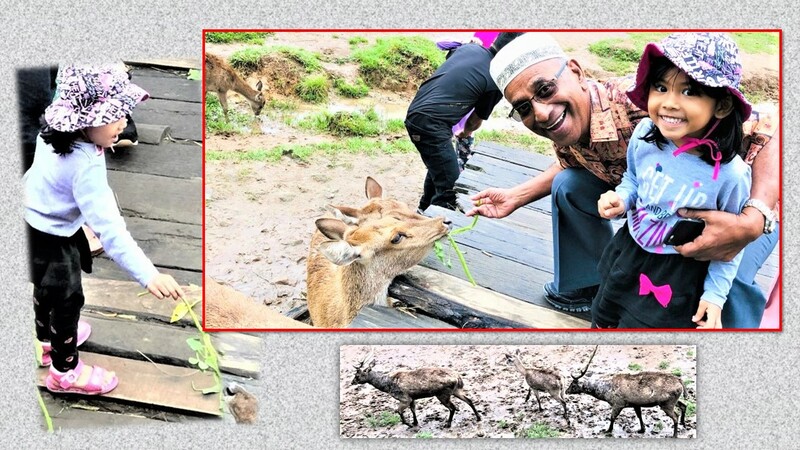 Iffah at a deer farm: Iffah enjoys feeding the deer with vegetables bought at the farm. 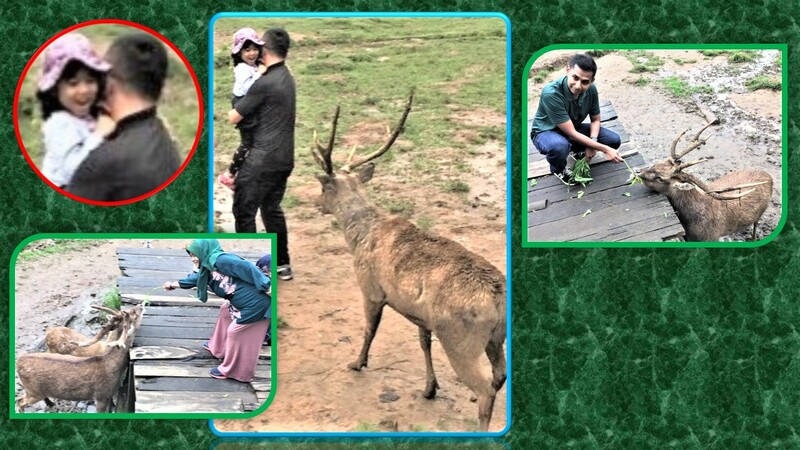 Iffah even ventured into the farmland and, although she was carried, felt uneasy when a deer came too close to her “asking” for food. 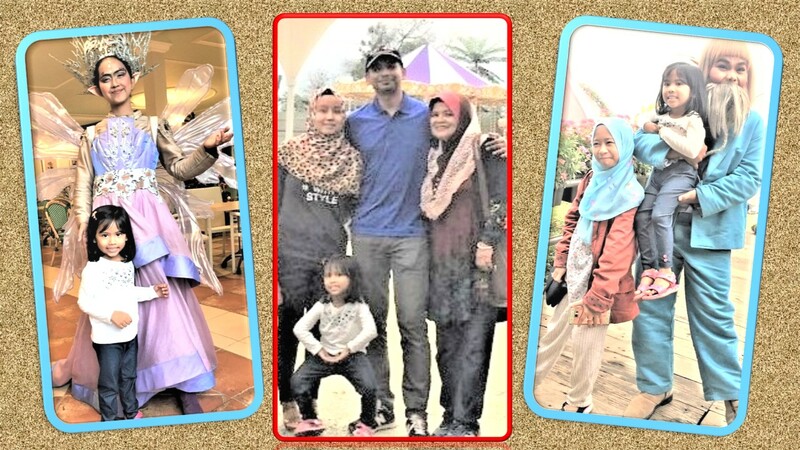 At “Fairy Garden”, a kids’ wonderland. 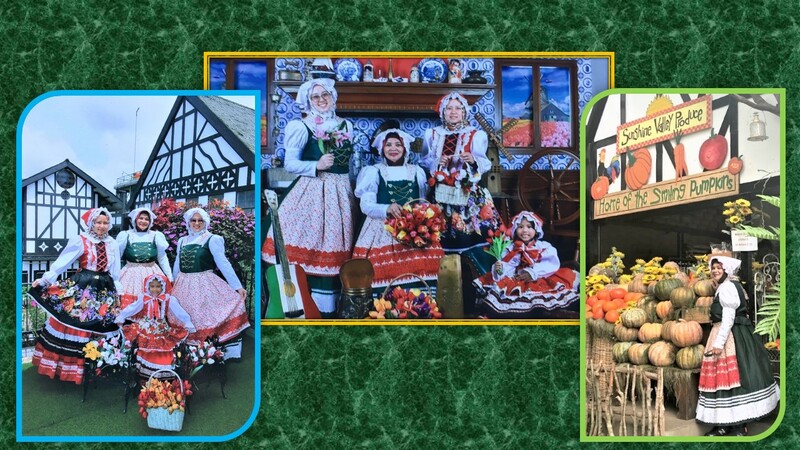 A group photo with some of the characters of “Fairy Garden”. Wooooo…it’s so scary: Iffah in the world of ghouls and ghosts. 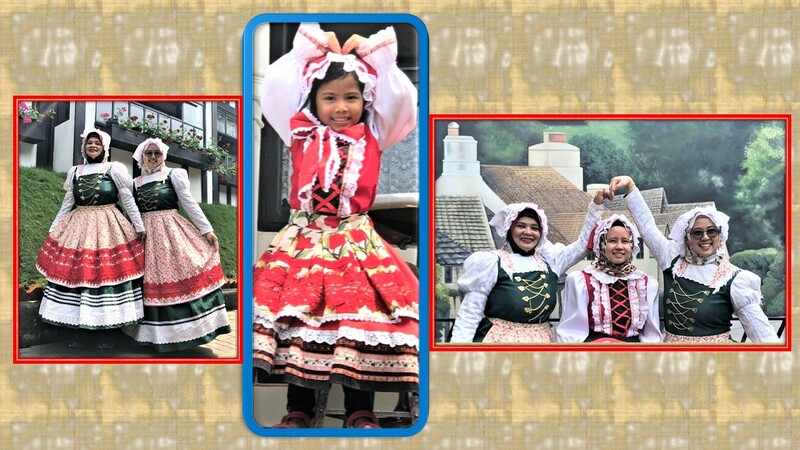 ….and ”turning” themselves (Nani Khairon, Cik Nur, Iffah and Mammy) into Dutch ladies. At the Saung Angklung Udjo to watch the angklung (Indonesian musical bamboo instrument) performance. 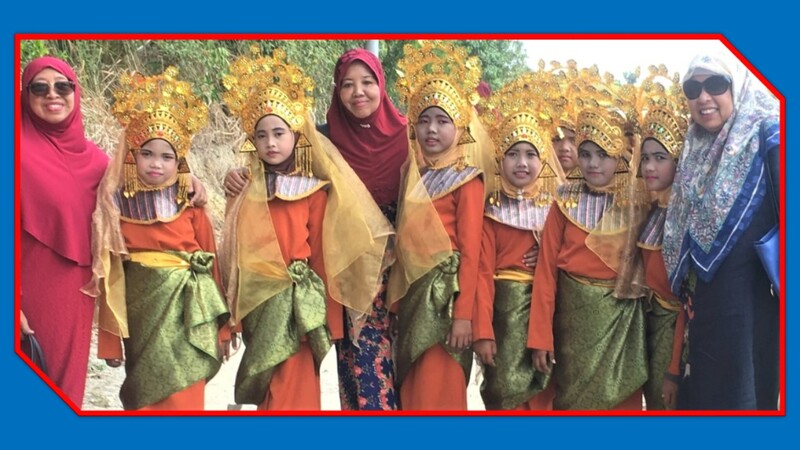 Then, at the end of the performance, the angklung dancers, mostly children, hastened in all directions of the gallery to get members of the audience to dance with them as a grand finale of the angklung performance. A cute little girl, about 3-years old, climbed up all the way to the top-most level of the gallery and came up to me. I was unable to say “no” to this angel and I held her hand and we went down to the dance floor and did a mass dance to the enticing sound of the angklung music. Iffah looks sad; probably she thinks we are going to leave Surabaya by taking a hot-air balloon to Singapore. No! No! 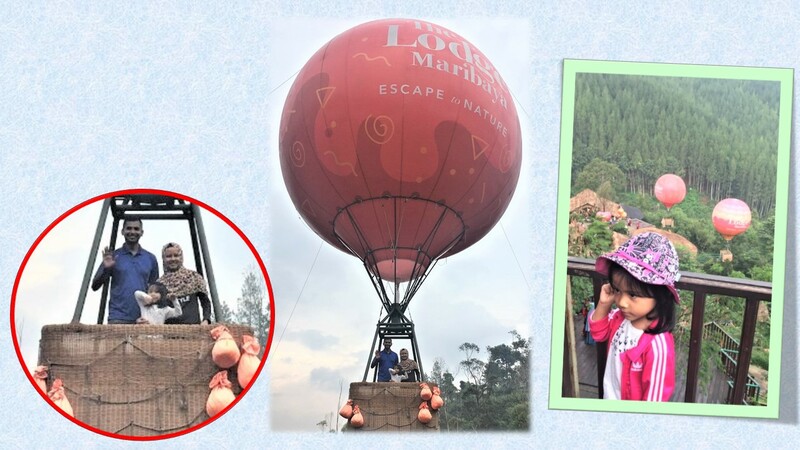 We can’t ride on a balloon to Singapore, and Iffah looked cheery after the assurance. 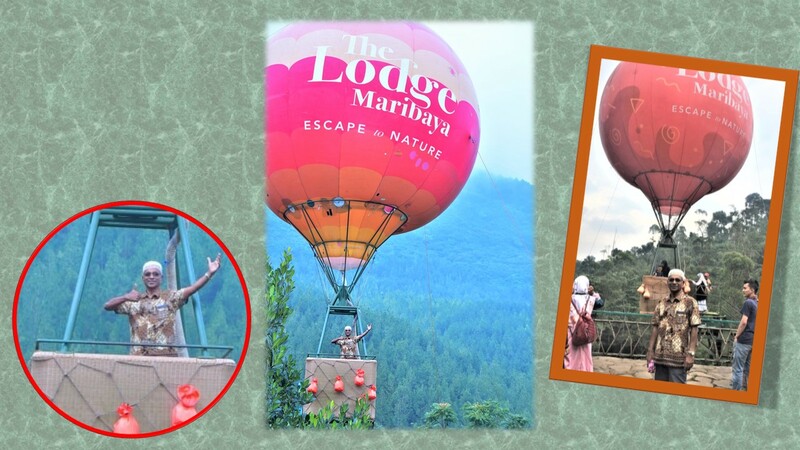 This place in Maribaya, called The Lodge Maribaya, is an “Escape to Nature” adventure park. With our driver (white tee-shirt) and guide (black tee-shirt) with Zuhal, our tour organiser. 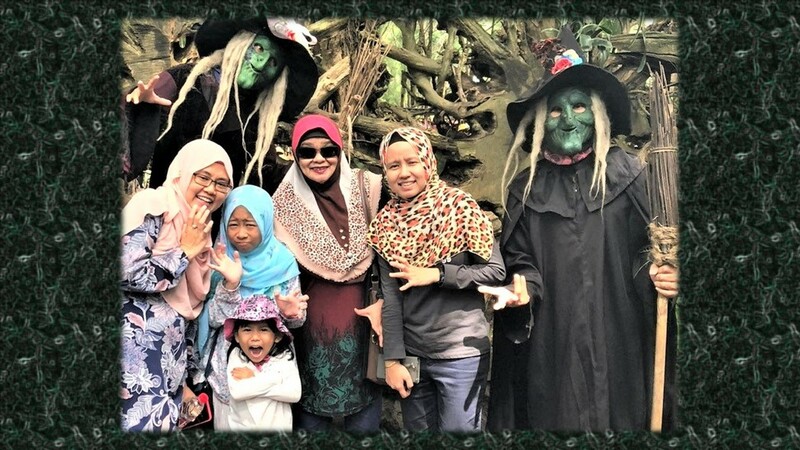 Iffah’s maternal grandmother, Salama (yellow headscarf), and paternal grandmother, Khairon (green headscarf), had a nice time together. 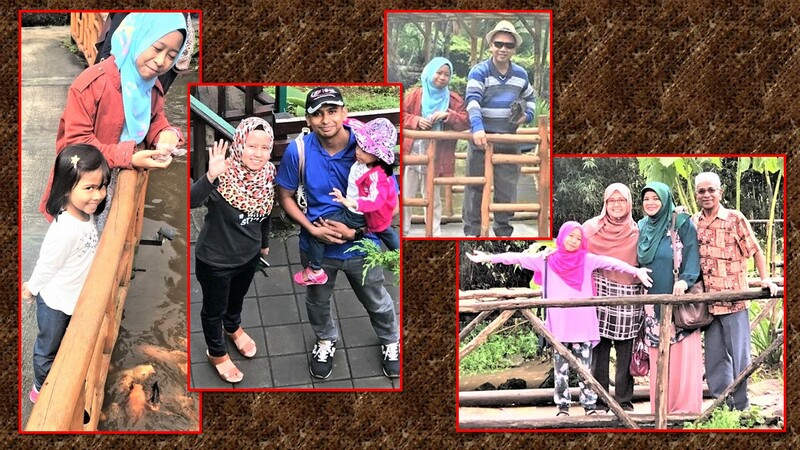 Iffah’s maternal grandfather, Sidik (yellow shirt), and paternal grandfather, Shaik Kadir, are always game for family tours together, the last being to Krabi, Thailand. 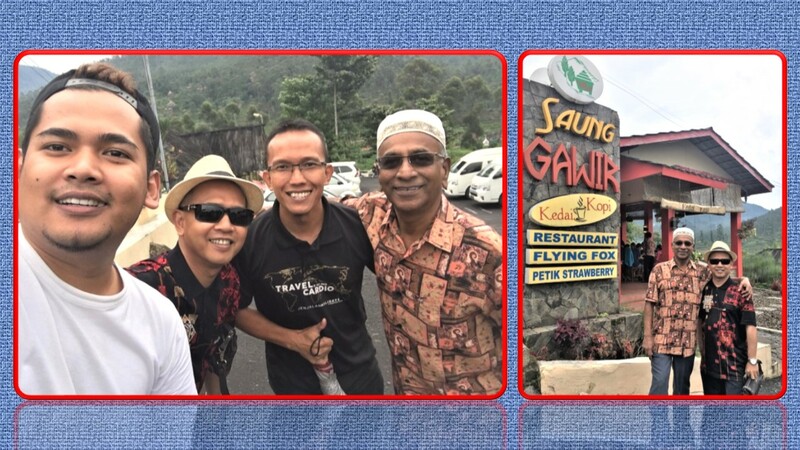 Yes, we did visit many interesting places in Bandung and enjoyed every one of them. 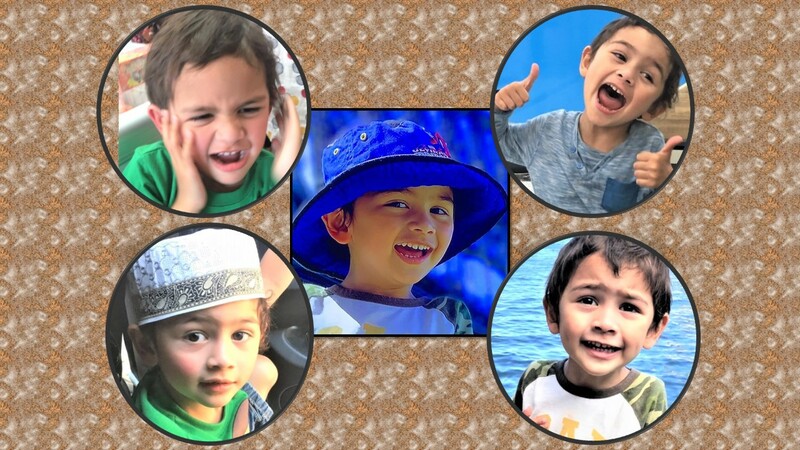 That’s Adam who is as always active as Iffah, his cousin. 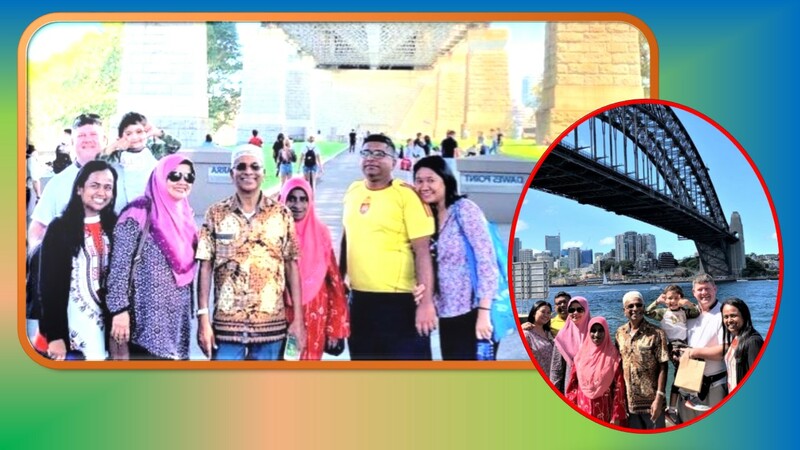 The 8-member Family under and near the Sydney Harbour Bridge: (From left, Allen Munirah and their son, Adam; Khairon, me, Hamid’s mother, Zainab; Hamid (yellow tee-shirt, and writer’s nephew who is Munirah’s cousin) and Hamid’s wife, Suriani. The Family at the Blue Mountains and at the Werrington (train) Station (small photo). At the “Anna Bay at Port Stephens”: Adam loves the beach, so we took him to two beaches, to this lovely Anna Bay Beach and Bondi Beach. Sand dunes? 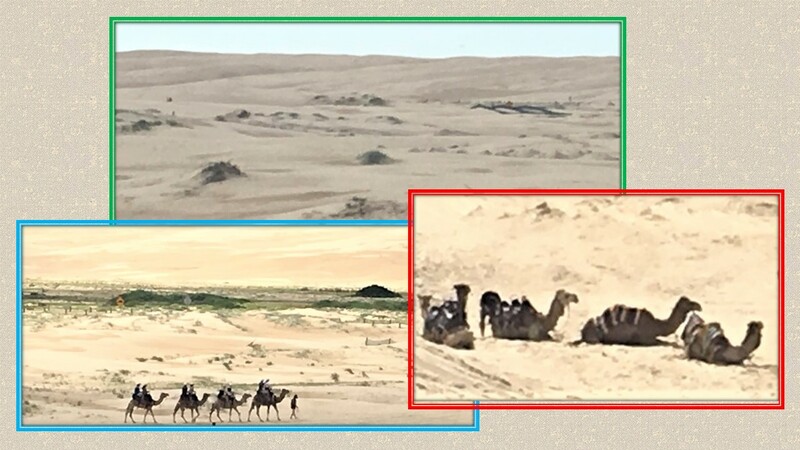 What’s this photo taken in the Arabian desert doing here? Wrong photo? No, it’s correct photo. 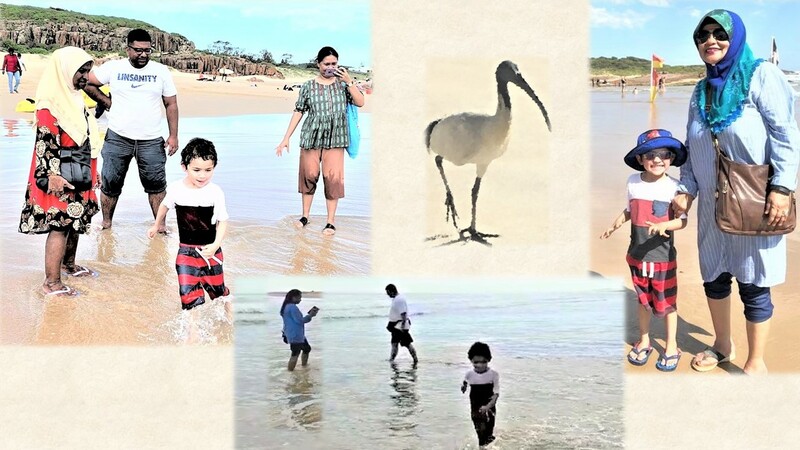 It’s in Australia, in Anna Bay near Anna Bay Beach. 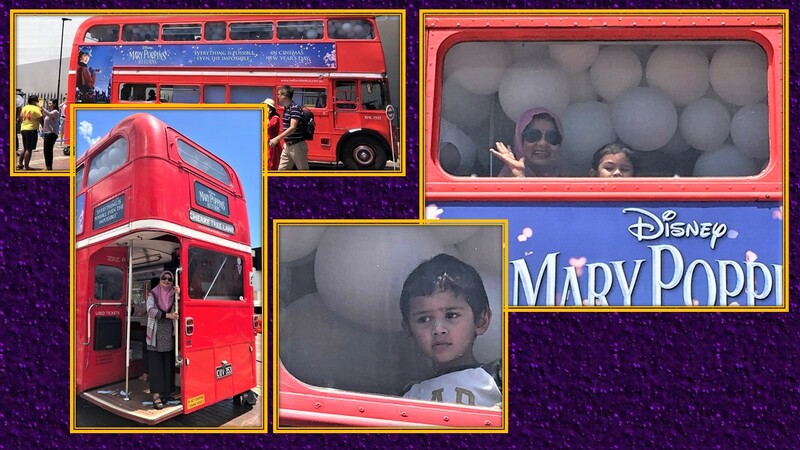 At the iconic Sydney Opera House area: Adam was attracted to the “Disney Mary Poppins Returns” exhibition bus and boarded it. 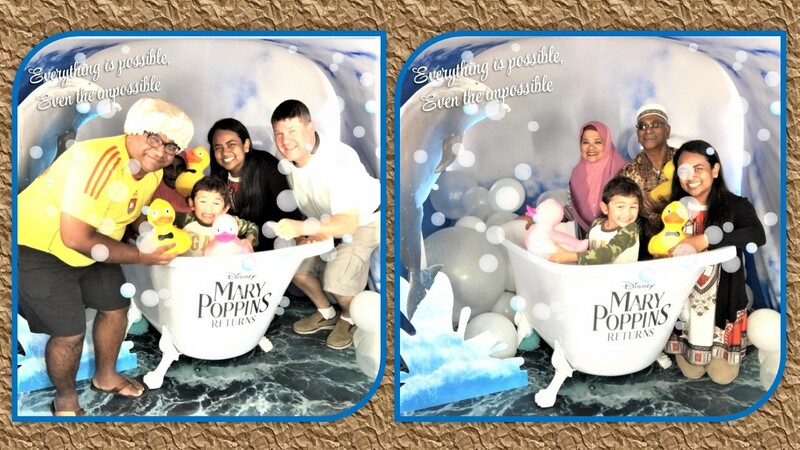 Photo-shoot inside the “Disney Mary Poppins Returns” exhibition bus. Resting and strolling in “The Rocks” area. 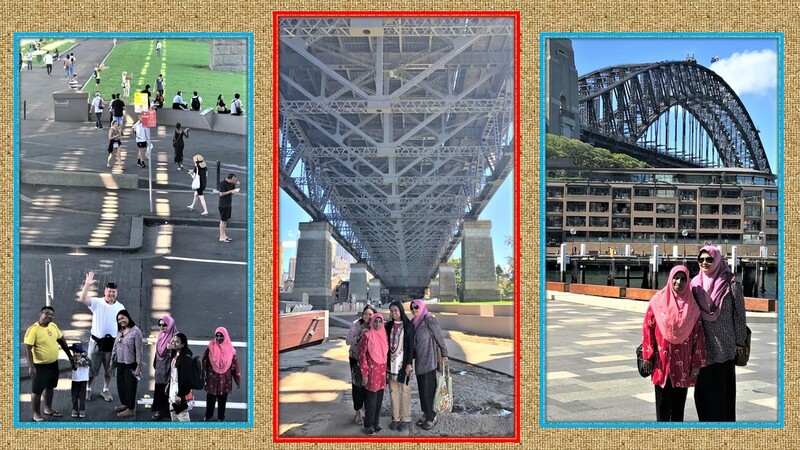 Under and near the majestic Sydney Harbour Bridge. 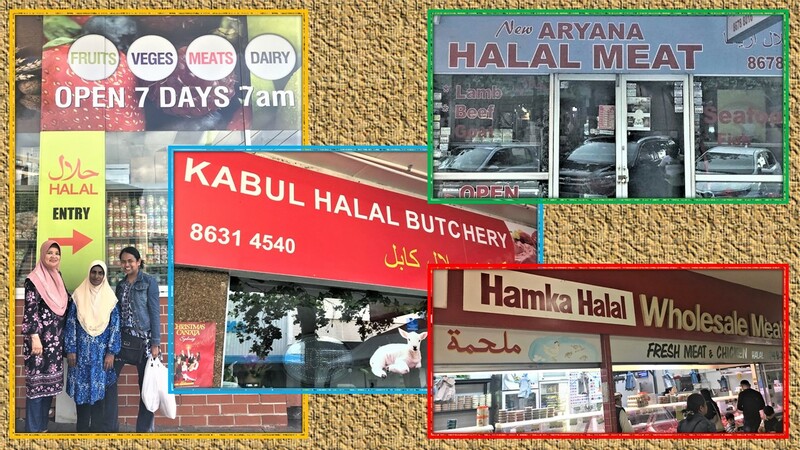 Halal: Nowadays it’s easy to get halal meat (beef, mutton and chicken) in Australia. 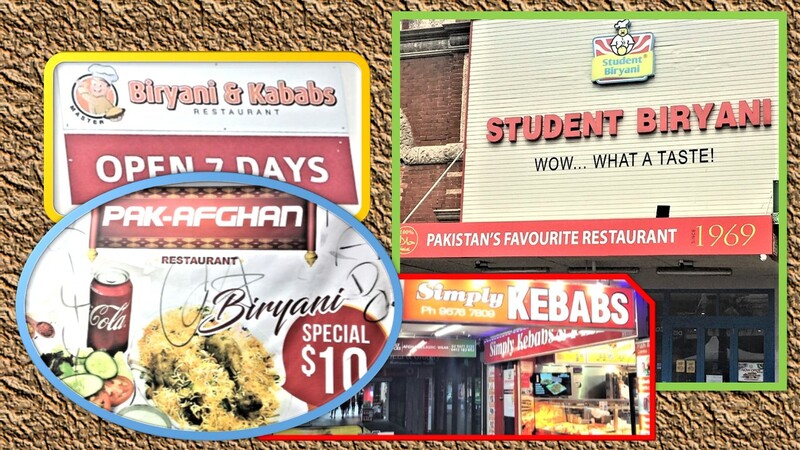 Briyani and kebabs: There are many Muslim eateries and restaurants where one can buy or eat briyani and kebabs. 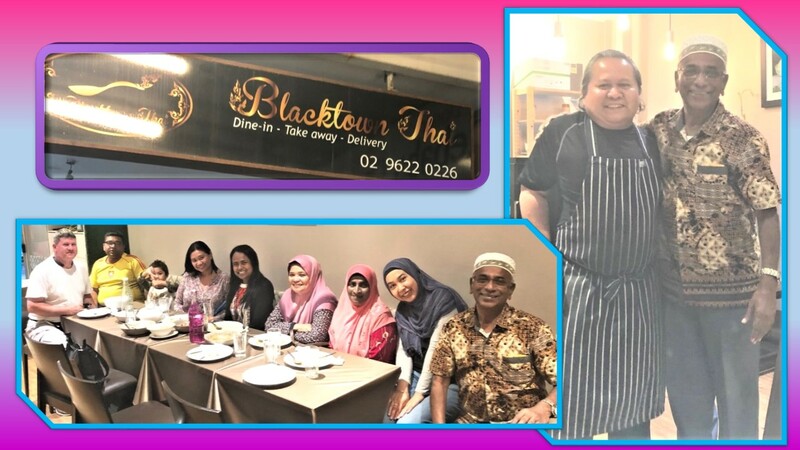 “Blacktown Thai” (in Blacktown) is a Malay-owned restaurant where we ordered green-curry, tom-yam and other cuisines. Seated on my right is Ms Nurli (black headscarf) who is my daughter’s friend. She and her husband, Mr Rizam (not present), own the restaurant. The food was so good and delicious that, in appreciation, I took a photo with the chef and co-owner of the restaurant, Mr Hidayat (stripped apron). At the Irukandji Shark and Ray Centre. 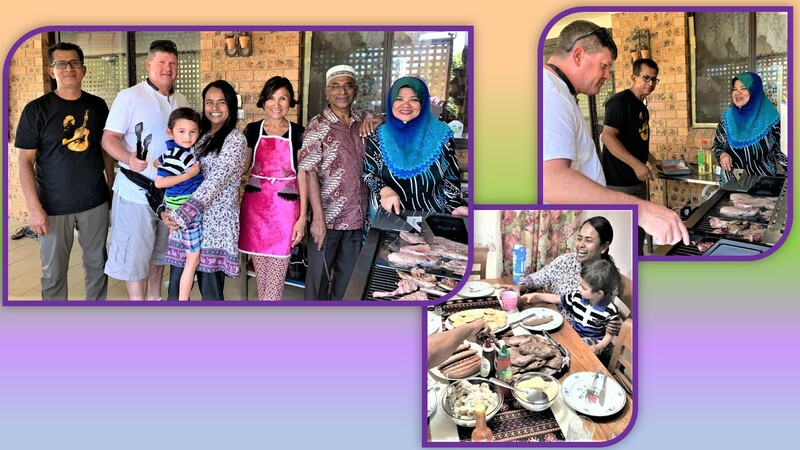 At the home of Mr Bakar (black tee-shirt) and his wife, Ms Mazlifa (pink apron): We were welcomed with a barbeque lunch. 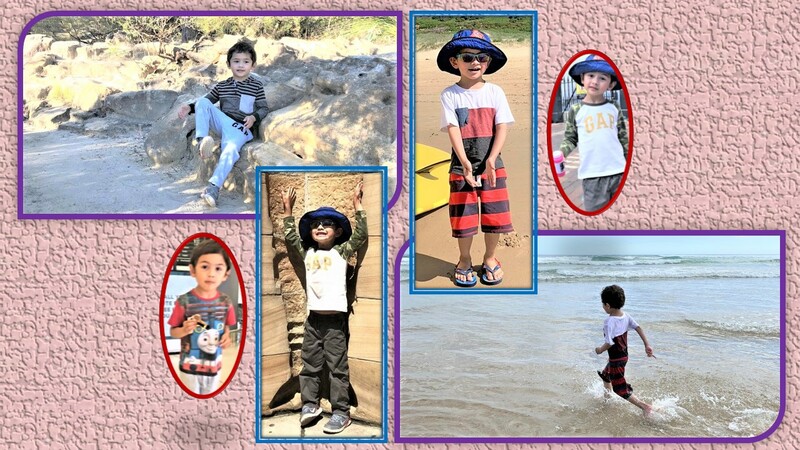 Adam even found a new companion – the hosts’ son, Abang Zac (Brother Zakaria). 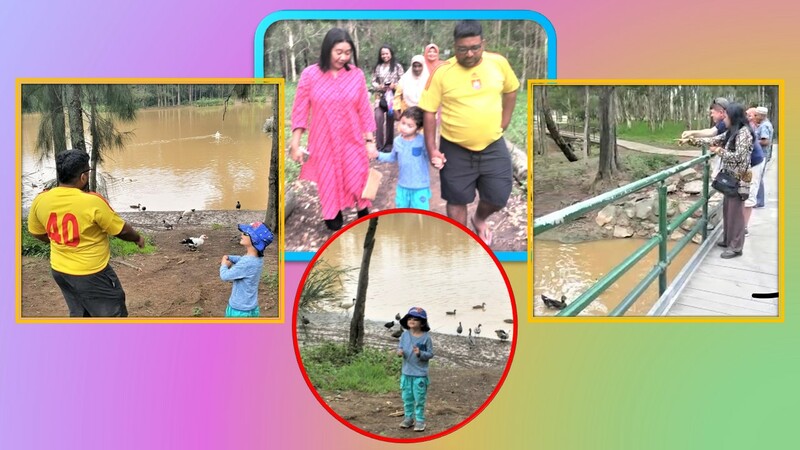 At the Werrington Lake Park (which is just 5 mins drive away from Adam’s home): Adam loves feeding the ducks and swans at the lake. 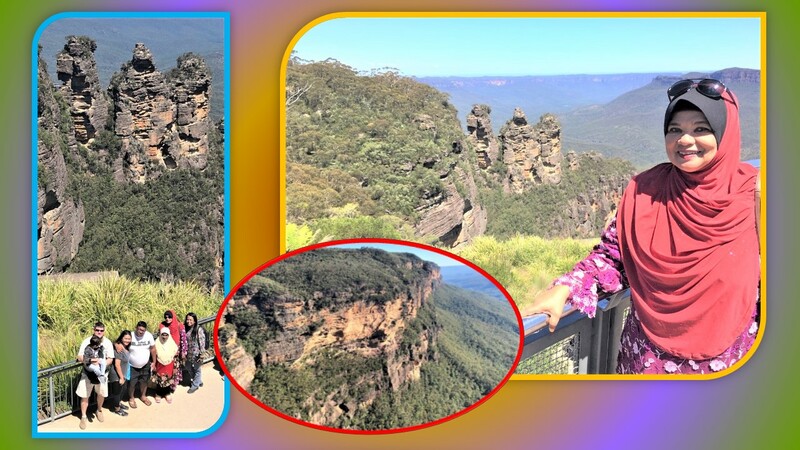 Blue Mountains: A range of three rocks, named the “Three Sisters”, is the main attraction of this mountainous region called the “Blue Mountains”. 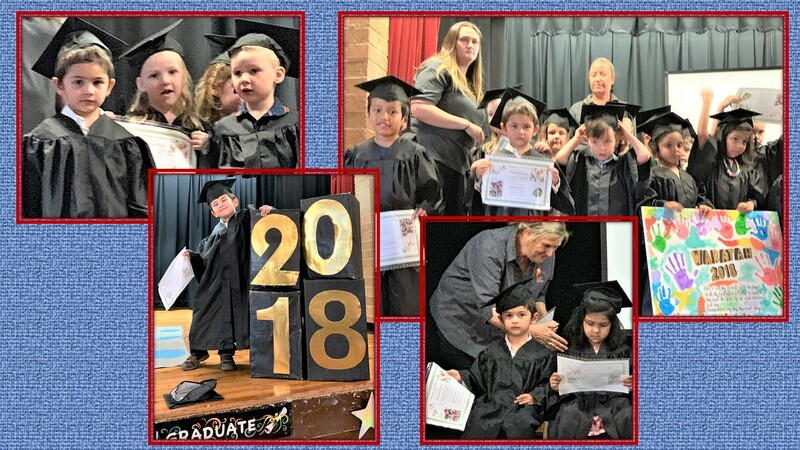 Pre-kindergarten graduation ceremony (held in December 2018) for entry into Kindergarten in 2019 : Adam and the other children excited to have received their pre-kindergarten certificates. 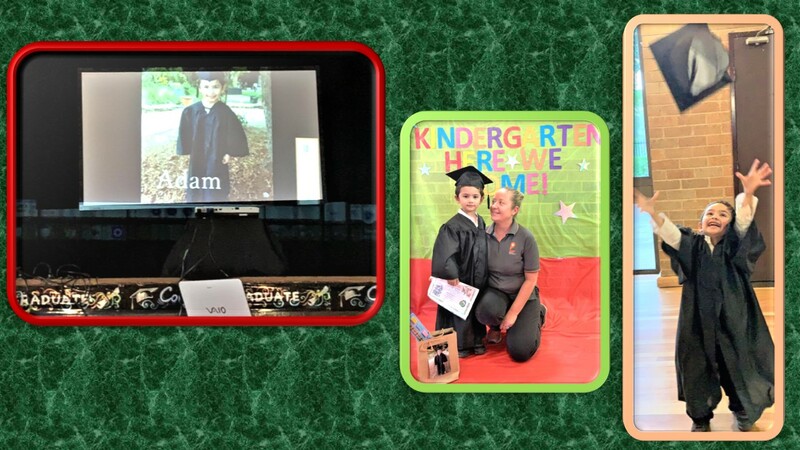 Pre-kindergarten graduation ceremony held in December 2018: Adam is looking forward to attend kindergarten classes this year (2019) in February. 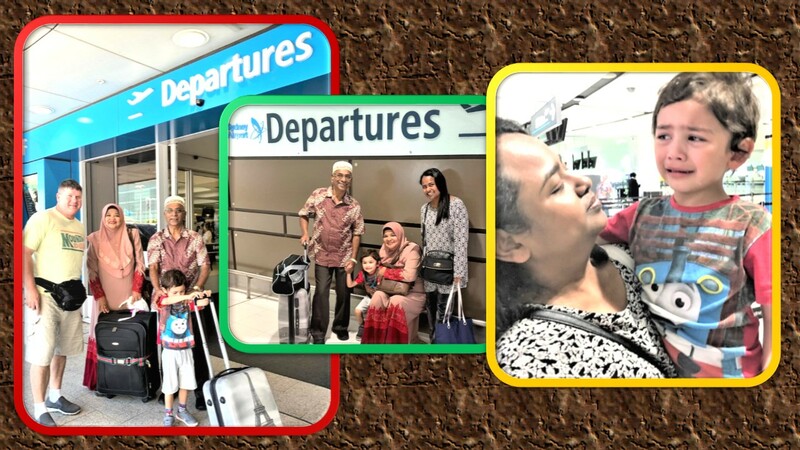 At the Sydney Airport: I (Atuk) and Khairon (Nani) leaving for Singapore – a sad moment for Adam…and for the grandparents, too. 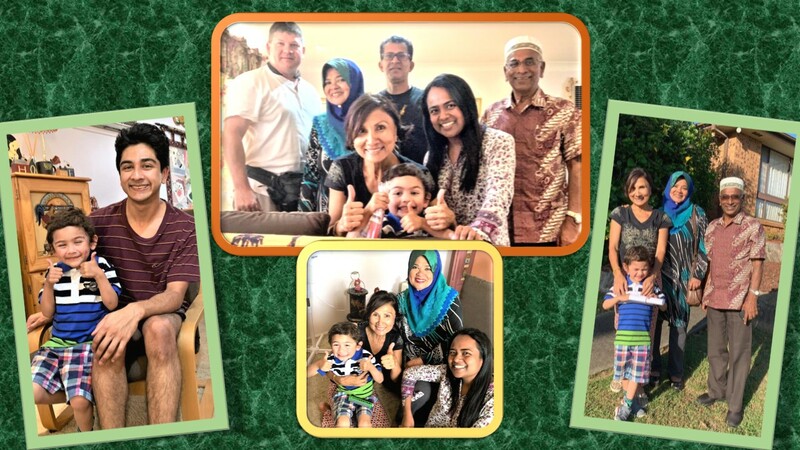 In September last year (2018) when Adam and his family came to Singapore to attend Munirah’s niece’s wedding, Adam and Iffah had the opportunity to have some nice time together. 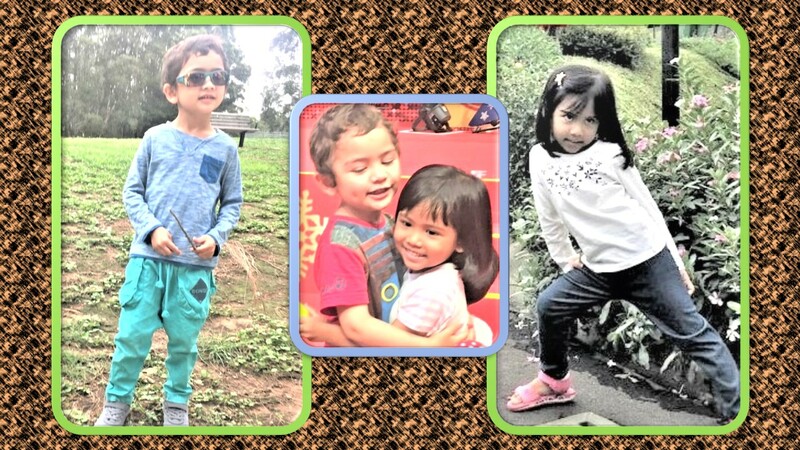 In September 2018: Adam and Iffah having fun together. Hopefully this year, these two close cousins, who are about one year apart, would have a nice time together again.